This work titled “Siegfried” by August Bischoff was a Hitler favorite and is expected to bring very big money at auction. 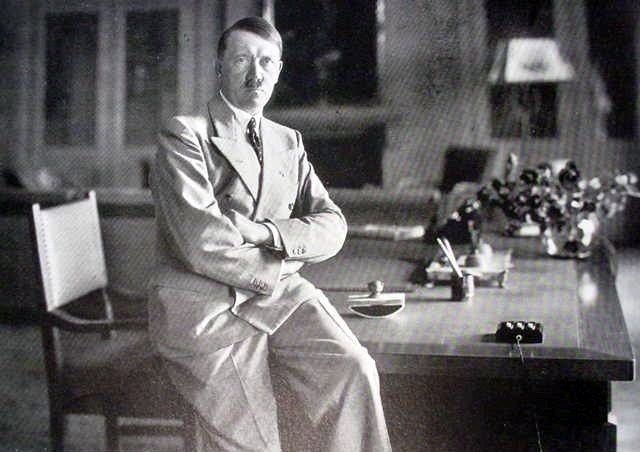 Adolf Hitler’s favorite artists and artwork, promoted throughout Nazi Germany and shunned as a result by the world for decades, is now on fire, with art collectors in America and Europe paying more than $150,000, to twice that. ”There’s a market here.” Marius Martens, a Dutch art dealer, said art from Karl Walther or sculptor Georg Kolbe, whom Hitler liked and whose work he displayed in Third Reich buildings, has finally caught the eye of collectors because the World War II period is now popular. “This is only the beginning,” Martens said, adding that he has received death threats for selling the artwork. 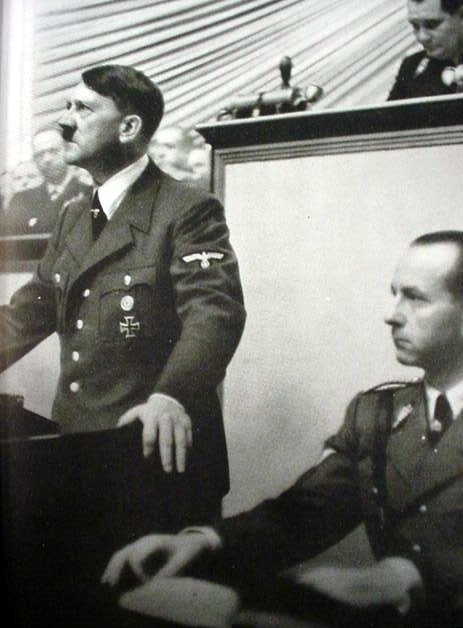 Martens told Secrets that the popularity of Hitler’s favorite artists sprang to life in just the last 12 months. “Last year, the market was awakened by the sale of a painting by Karl Walther for 23,000 euro. It was an extremely scarce piece as it once hung in the New Chancellery of Adolf Hitler.” he said. “It seems now that this was not a one-off occasion. Recently, works of other artists popular in the Third Reich have been sold for very considerable prices,” he added. “Almost 70 years after World War II, more and more people see this art from a purely historical perspective. Although the artworks originate from an extremely tragic period, they should not be hidden or destroyed. This is an opinion shared by several museums, seeing the rising number of exhibitions of this art and the number of visitors,” said Martens. He added that as the World War II generation dies off, its period becomes history. “The driver is time. Just like no well-thinking human being bought a portrait of Napoleon in 1820, short after he destroyed Europe,” said Martins. “In the coming 10 years everybody who lived in the war will die: this means that living-past will change into history.” Paul Bedard, the Washington Examiner's "Washington Secrets" columnist, can be contacted at pbedard@washingtonexaminer.com. The British philosopher and historian R.G. Collingwood said, "It is not the facts that are interesting in history, but the questions and their answers - and these can never be fixed." 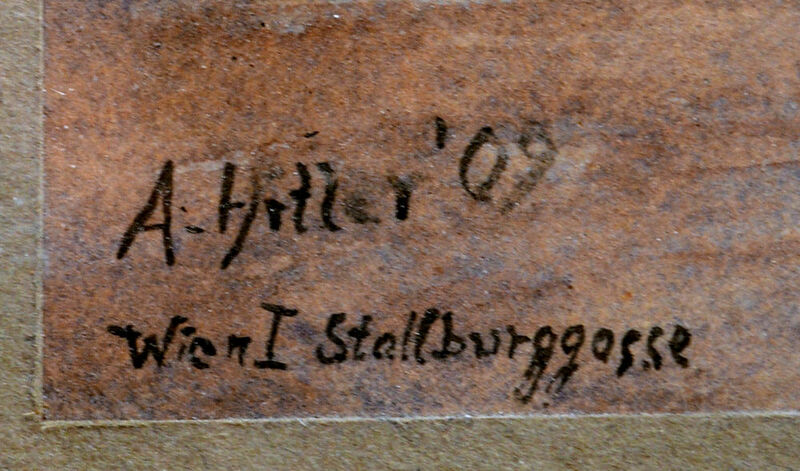 Hitler’s signature changed over the years. Authentic watercolors by him have been seen with several of his varied signatures (No two were ever alike.). 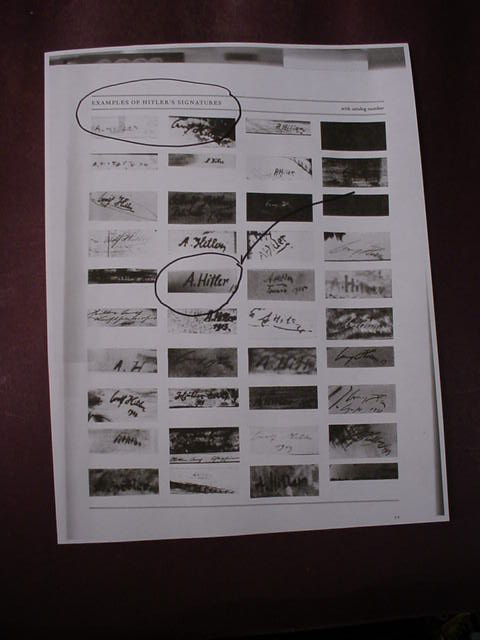 Please understand that not all the signatures pictured in this image are from paintings, but they are from Billy Price's book Adolf Hitler: The Unknown Artist. 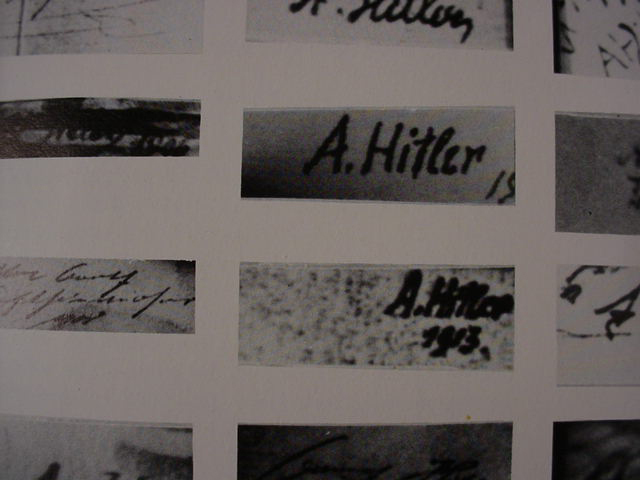 Those signatures in rows 4 and 5 are actually from Hitler's various watercolors. Note that the third one in row 5 is nearly identical to the one on the castle painting as seen above. 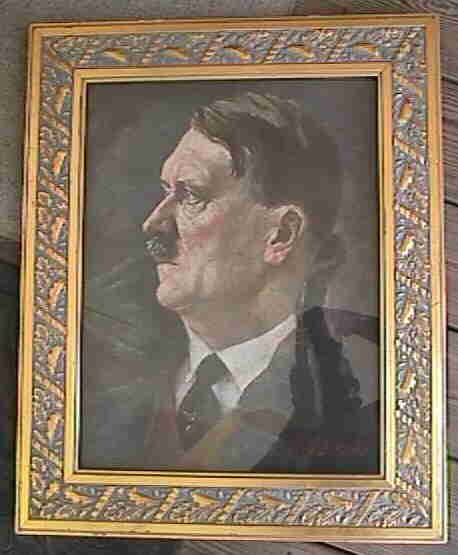 DESCRIPTION: Recently, we were very fortunate to purchase two paintings by Adolf Hitler that are actually considered among his best. 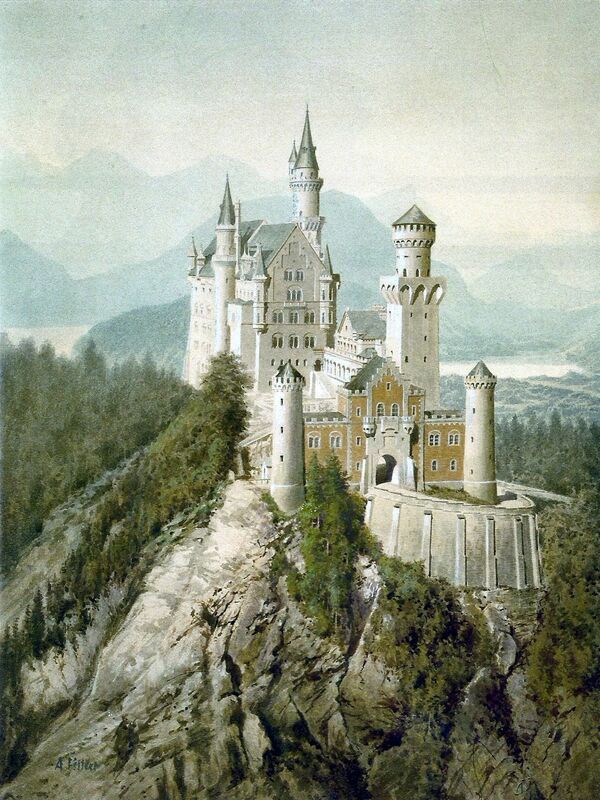 This first one shown here is an absolutely gorgeous rendering of the Castle of King Ludwig II of Bavaria—Schloss Neuschwanstein (New Swanstone Castle). 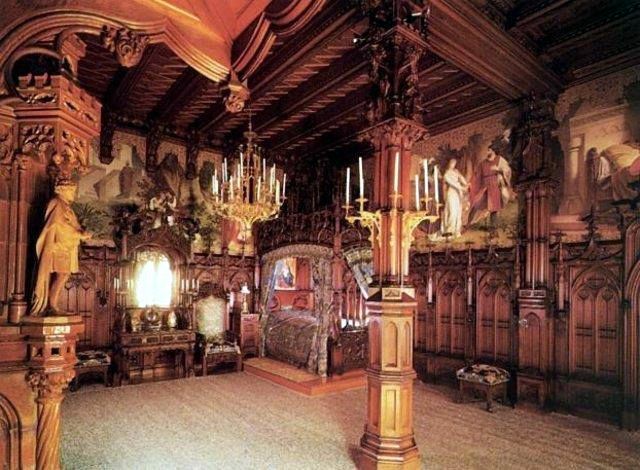 This is a nineteenth-century Romanesque Revival palace. 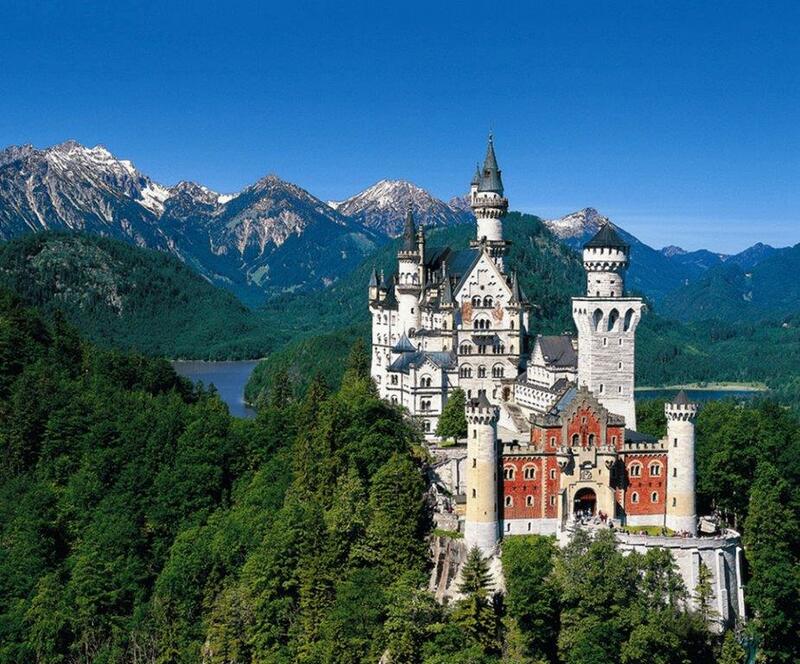 It was built by King Ludwig II as a devout homage to the great composer Richard Wagner, whom he practically worshipped. 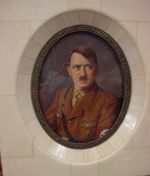 Therefore, it only follows that Adolf Hitler, who was also a devoted fan of the great Wagner would seek to honor him. 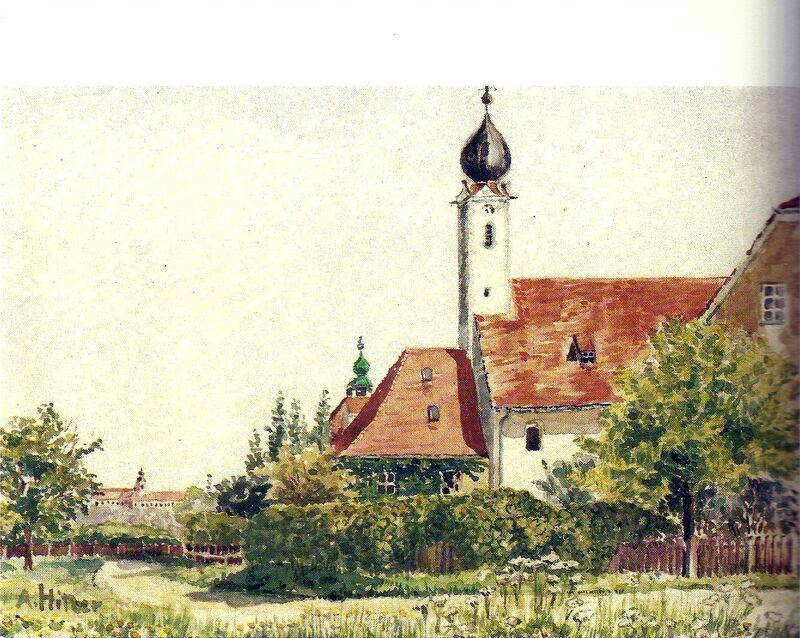 It seems only logical, therefore, that New Swanstone Castle would be a natural for the young Hitler to paint at some time in his artistic career and, in my estimation, his infatuation with Wagner would have enthused him to positively strain to make this fantastic watercolor one of his finest works. 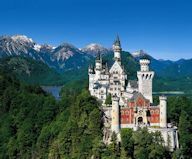 The majesty of the castle as seen in Hitler’s painting is spellbinding and all who have seen it have praised it not only because it is Hitler’s work, but the painting itself emerges as a classic example of fine art of the Western world. Yes, it’s that great! 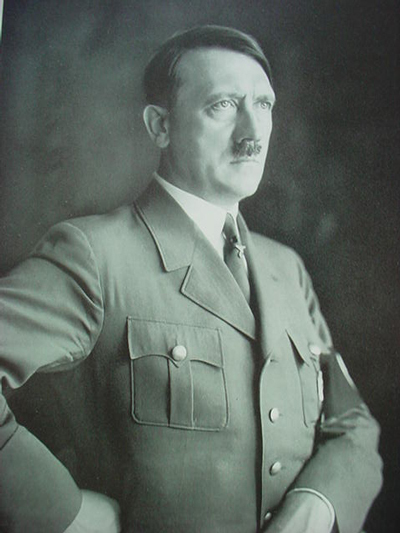 Crude propagandist authors have said that Hitler was only a “house painter” before he became Germany’s leader. I am sure you have heard or seen that ignorant old canard more than once. Well, dear reader, this is one of the “houses” he painted. 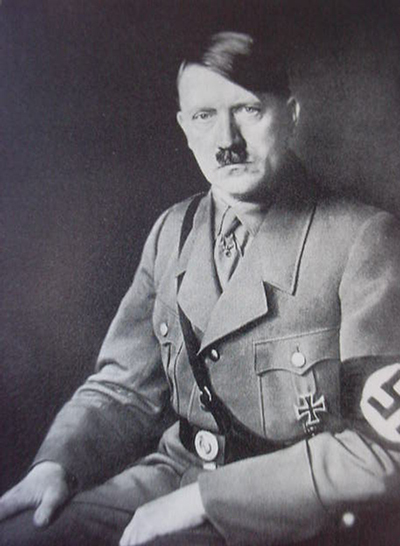 So just like all the other lies told about the German Führer this one needs to be trashed as well, wouldn’t you agree? We at Germania are proud as peacocks to offer this (dare I say: “masterpiece?”). “Yes, I dare!” Of all the watercolors painted by Hitler, this is one of the largest we have seen. 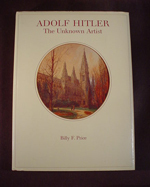 The only full and significant literary work dealing with Hitler’s paintings is titled Adolf Hitler: The Unknown Artist by Billy F. Price, and this painting is shown on page 181 of the book and is listed as plate number 6/100. 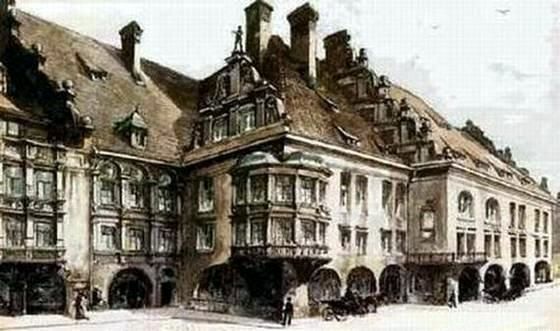 Where it is shown it says it was painted in 1914 and I think it may have been among the last renderings he produced before enlisting in the Bavarian Army and going off to war. 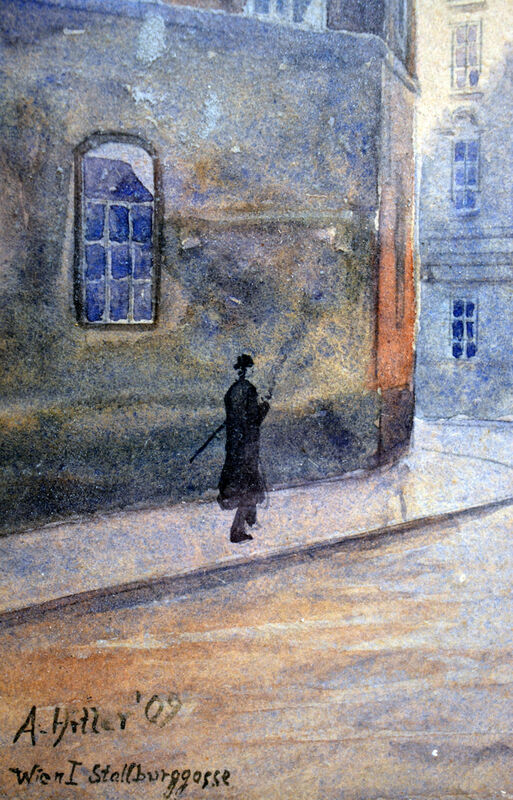 He still found some time to paint a few Munich scenes during that period. Painting was his favorite thing in life and with high hopes, he took the examination to attend art school. To his complete disappointment, he and 85 other candidates failed the exam and were denied entrance to the prestigious Vienna Academy of Fine Arts. Today, we know that the test was stacked against the candidates; the required subjects of the exam were rather strange and the judges may have been rather prejudiced toward certain applicants from “select families.” We will never know, but when one views either of the paintings that we at Germania have procured and offer, there is not a shadow of a doubt that the young Adolf possessed a genius in architectural mastery in the arts. Just as he had opinions in the political arena and in the winning strategy in warfare (Blitzkrieg) his opinions and thoughts about art were strong and rather far beyond conservative. He believed strongly that “healthy art” had a “healthy soul.” He claimed it should be uplifting, noble, and idealistic. 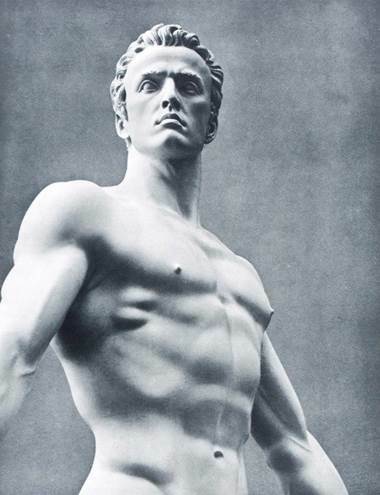 He considered certain themes such as the family, everyday work, mythology, rural life, and landscapes, the perfected human body, or the heroic soldier to be subjects worthy of art even though we know that depicting people was, as he admitted, not his specialty by any means. Of course, his ideas about the refinement of art seriously conflicted with the emerging schools of modern art forms, Impressionism, Cubism, Dadaism, et al. He claimed these terrible aberrations were produced by “scribblers, canvas crawlers, mental defectives, or cultural Neanderthals.” (Well put, Mein Führer!!!) Cicero said: “If we are not ashamed to think it, we should not be ashamed to say it.” So, I will say it also: “I agree with every word Hitler used in his critique of modern art.” Hitler’s architectural concepts were based upon his belief in “eternal values.” These values can be obviously perceived in his artistic works. These values contained mixed elements of classism, the renaissance, and the baroque all of which were amalgamated in the “Vienna Ring Style." This monumental expression of the 19th-century imperial power may well have been the most significant architectural feeling generated in Hitler’s youth. He was acutely impressed with so many masterpieces of the building sciences as could be seen in Vienna such as the Burgtheater, the Votive Church, city hall, and Theophil von Hansen’s great Austrian Parliament building. Hitler knew these buildings down to their finest details and painted them repeatedly. 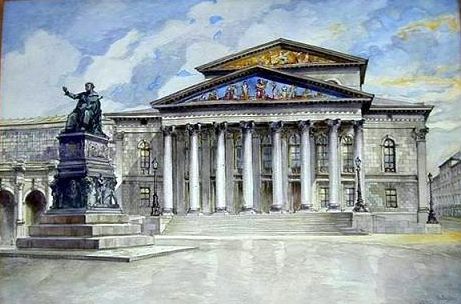 One of Hitler's favorites, which he painted several times, was Karlskirche, St. Charles’s Church, and this one also was one of the favorites of art researcher and authority Peter Jahn. 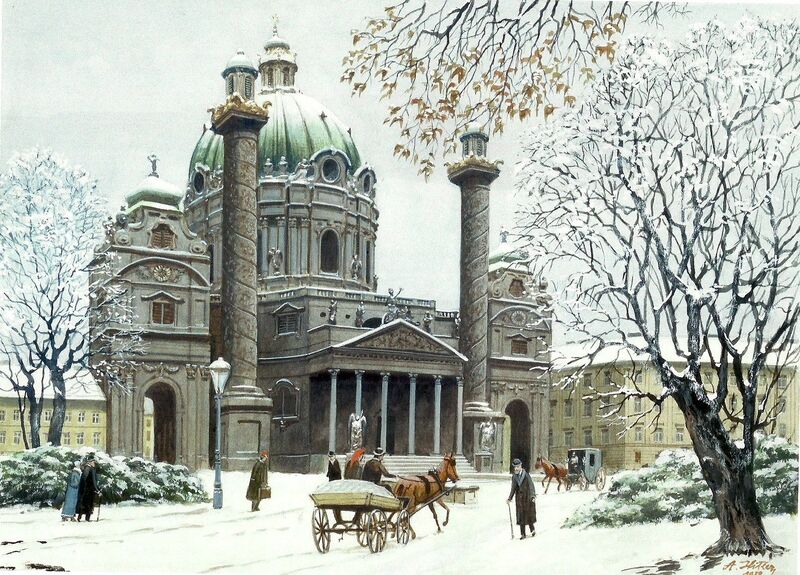 This is the second Hitler canvas that we offer and is an original rendering of Karlskirche. 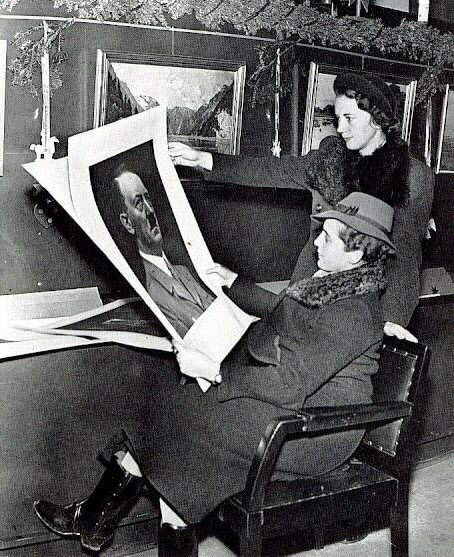 Peter Jahn of Vienna and Dr. August Priesack were considered the leading experts able to authenticate the paintings of Adolf Hitler. In 1935, the historical section of the NSDAP official archives in Munich was assigned the systematic task of locating and certifying the paintings of Adolf Hitler. 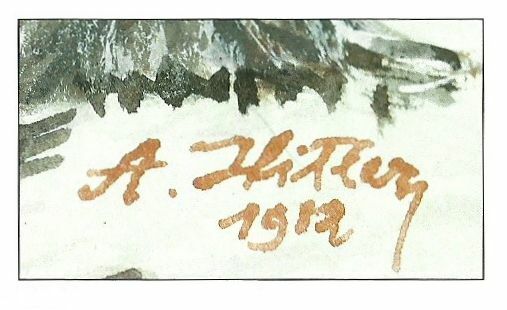 Two archivists, Wilhelm Dammann and Dr. August Priesack, worked together and were responsible for authenticating all Hitler artwork that could be traced, purchased, or borrowed. 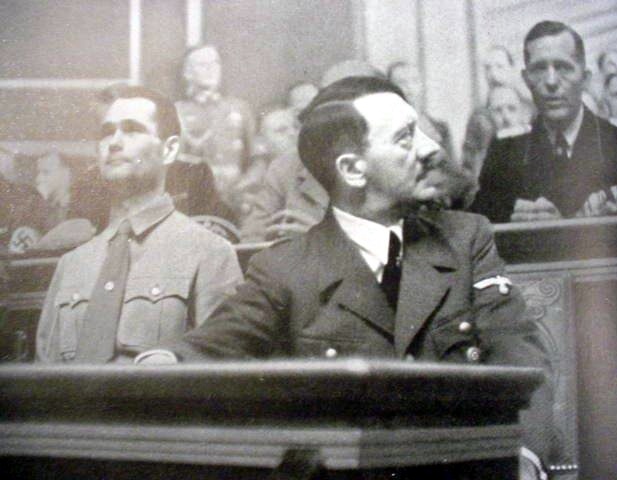 The actual search for the art was carried out by staff members under the auspices of Hitler’s deputy Rudolf Hess. One authority that I mentioned earlier was Peter Jahn. 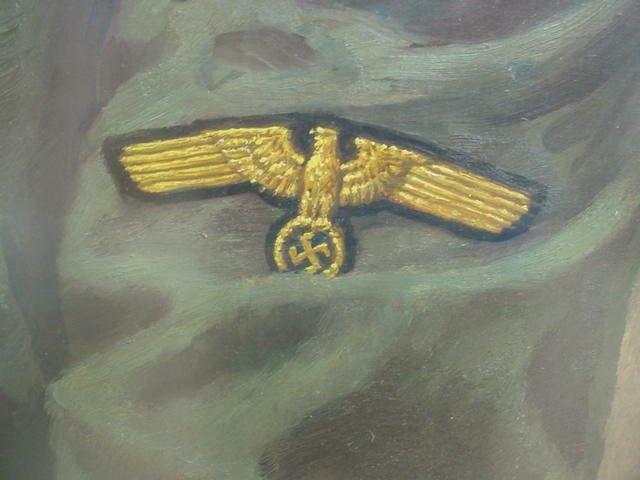 He and Dr. Priesack were the last surviving experts in the NSDAP search for Hitler’s art. Jahn had many conversations with Hitler considering art in general, but particularly the Führer’s own art. 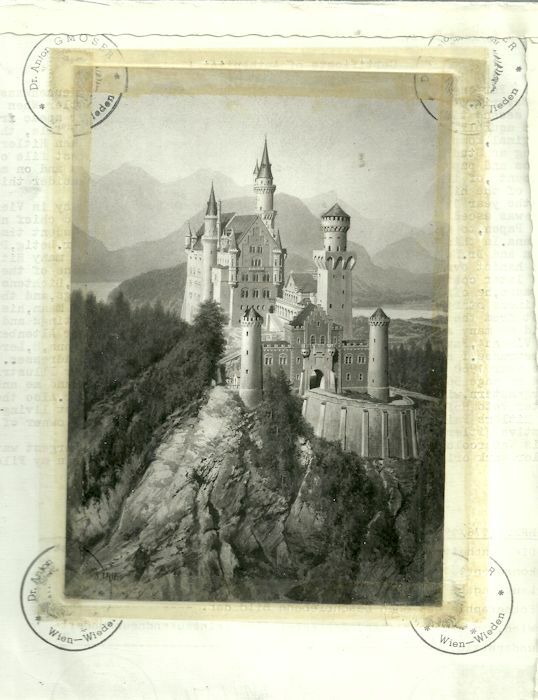 With this painting of the castle there is an official letter of authenticity from Peter Jahn regarding this watercolor in detail. Jahn recalls a conversation with the Reich’s Chancellor himself regarding this particular work, as actually being the largest surviving watercolor by Hitler. The work is in fine condition and measures 23.5 x 15.5 inches. After the war, Jahn resumed his consulting career with no thoughts of his former activities on behalf of the Hess staff. When his name was mentioned in a magazine article in 1960, however, he received inquiries from all over the world and agreed to serve as personal advisor to the English Marquis of Bath when the latter began his large, personal collection. Through his knowledge of Hitler’s Viennese style and subject matter and his numerous contacts in Vienna, Jahn has long been an authority on the subject and has traced and authenticated numerous paintings. 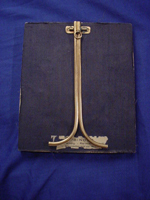 His files and references were particularly useful to author Billy Price in writing his great hornbook on the subject Adolf Hitler: The Unknown Artist. Today, this book is one of the few works that covers the subject so thoroughly and interestingly. 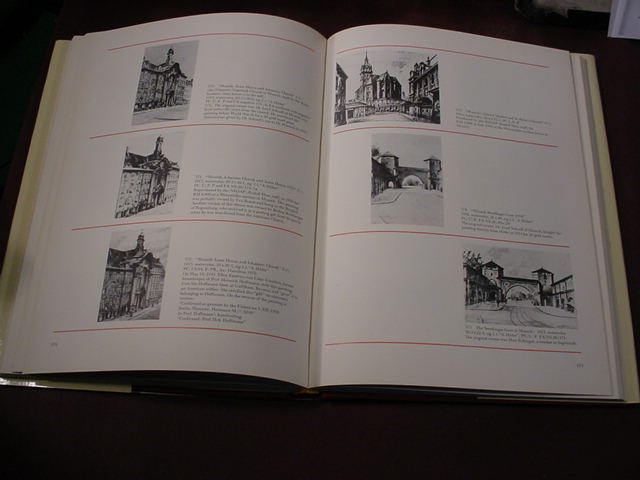 Both the paintings we acquired are shown in the book, but the Schloss Neuschwanstein canvas is unfortunately depicted in the noncolor section of the book; the St. Charles’s Church in winter, though, is shown in a large picture on page 49 of the price book. 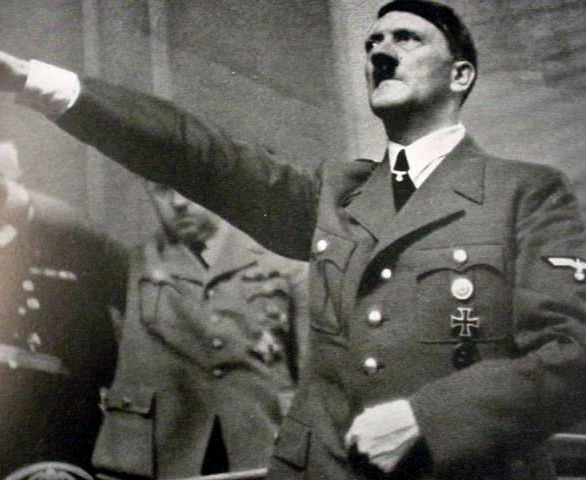 Hitler will forever be one of the most famous leaders in the history of mankind and the mystique and fascination surrounding him seem completely unending and if anything, he seems to be becoming more and more popular with his book Mein Kampf clocking a banner digital year in 2013 and 2014 when it became an e-book bestseller on Amazon. The Kindle version of Mein Kampf was ranking way up there on the politics and current events far outpacing books by modern day neoconservatives such as Sarah Palin, Charles Krauthammer, and Glenn Beck. So, if the book and the popularity of his artwork tell us anything beyond what is recorded in the pages of the dubious horror stories out there, it may just occur to some readers today that here was a remarkable individual and artist (a very talented artist) who turned into a “reluctant politician” and military leader whose ultimate aim was the preservation and advancement of his Fatherlands (Germany and Austria) and the creation of a “Great Art” and the preservation and protection of the Aryan culture and architecture. 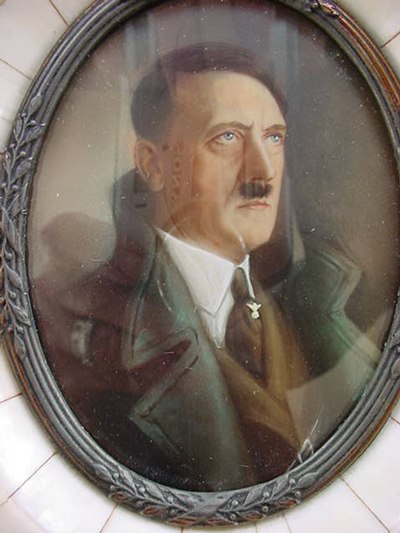 From time to time, we see Hitler’s artistic watercolors being offered in the $10,000 range. In fact, this is a huge underestimate and can only be applied to paintings that are probably fakes or have little or questionable provenance. 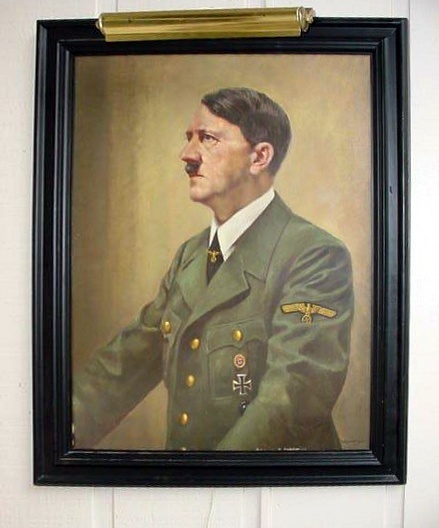 Genuine Hitler watercolors with good provenance from August Priesack or Peter Jahn have sold from reputable auction house for between $50,000 and $90,000 over the past ten years with about $50 thousand to $60 thousand being brought for an average one in 2011-2013. The two we offer are far beyond average. The authors of several books by persons who sought to denigrate the Führer would invariably show his poorest paintings in their books to portray his works and the renderings as what they dubiously called a “lifeless art form.” So in essence, we are genuinely thrilled to bring forward to you these virtual masterpieces from the brush of the Führer. Not exactly lifeless, are they?! 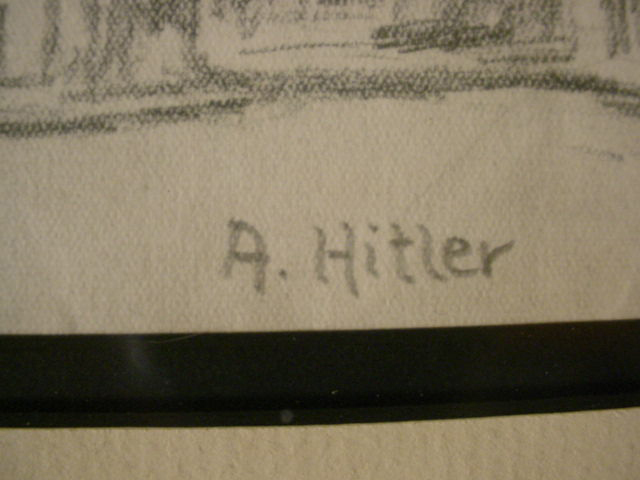 This is the actual watercolor by Adolf Hitler. 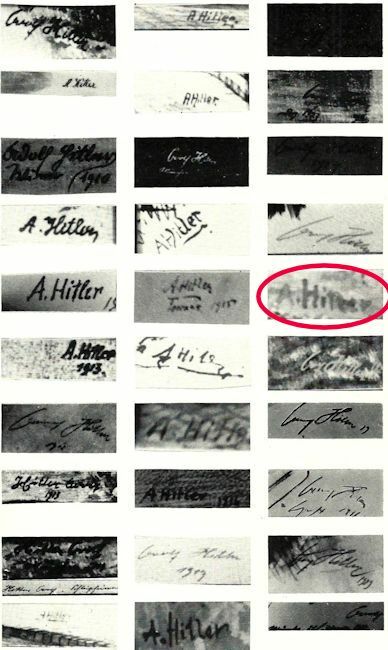 Hitler’s signature changed over the years. Authentic watercolors by him have been seen with several of his varied signatures (No two were ever alike.). Please understand that not all the signatures pictured in this image are from paintings, but they are from Billy Price's book Adolf Hitler: The Unknown Artist. 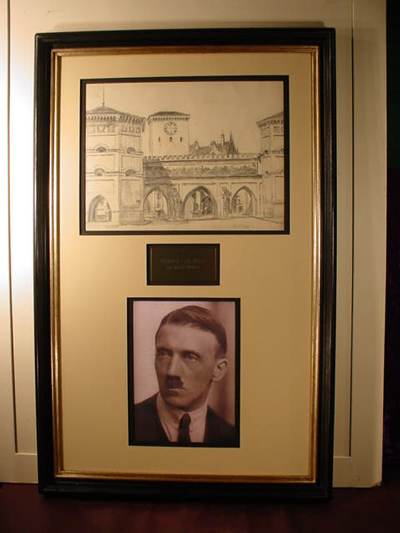 Here is the expertise and certificate of authenticity by Peter Jahn in reference to this watercolor by Adolf Hitler. 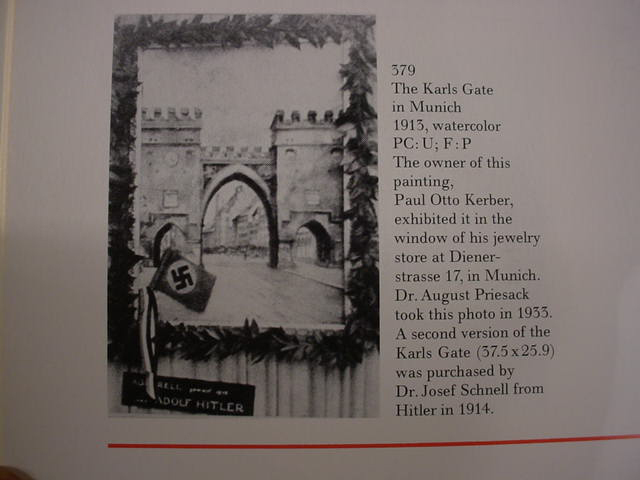 Peter Jahn, along with Dr. August Priesack, were the only recognized authorities able to accurately authenticate Hitler paintings. 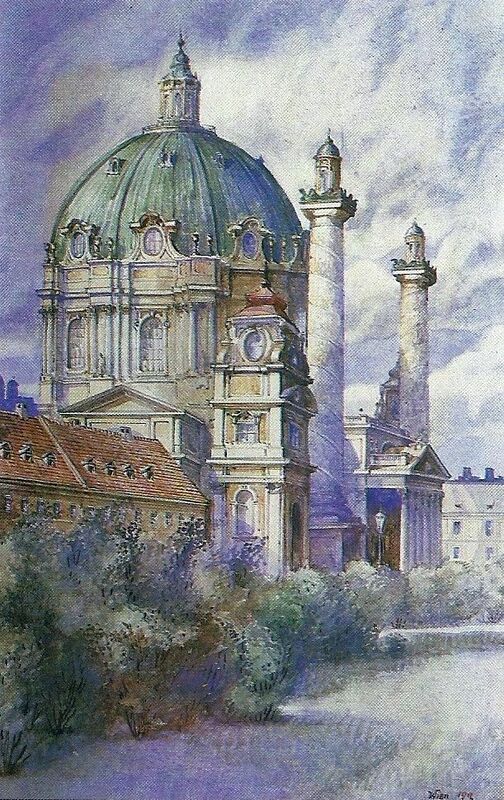 Here in rather broken English Herr Jahn says unalterably that the Karlskirche in Vienna signed by Adolf Hitler and dated 1912 is authentic and he praises it as the second-largest Hitler watercolor he had ever seen and is wonderful in detail and impression. He goes on to say that he considers it to be one of the finest and most naturalistic ones he had ever personally held. He says the background displays high technical expertise and has not seen many of this high quality (Excellent!). 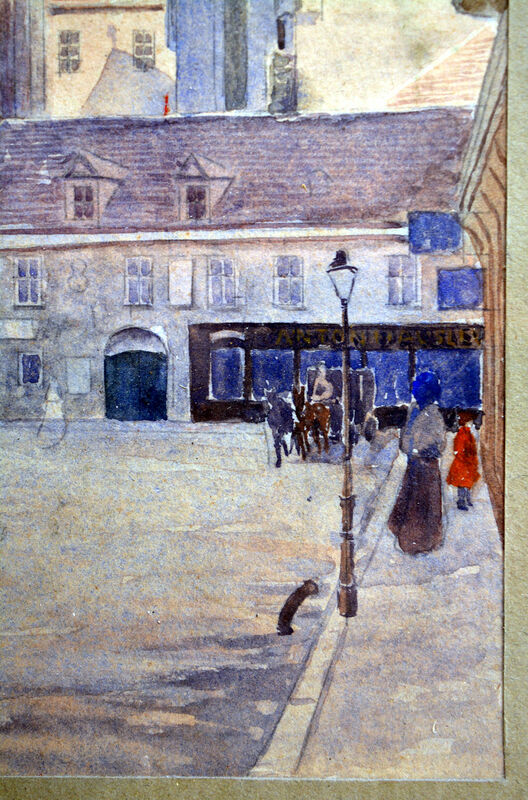 In this watercolor one can see Hitler’s great talent as a painter. 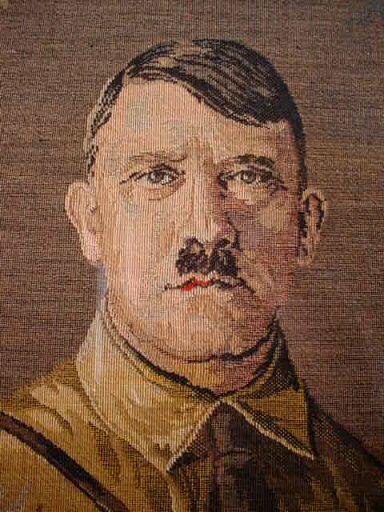 After giving a short narrative on his life and career, he goes on to say that this picture is, in his opinion, one of the largest and most beautiful works done by the hand of Adolf Hitler. The statement is with the signature and official stamps of a notary who notarized Peter Jahn's signature in 1982. Interesting that Peter Jahn did this statement on April 19, 1982, the day before Hitler’s birthday (Significent?). 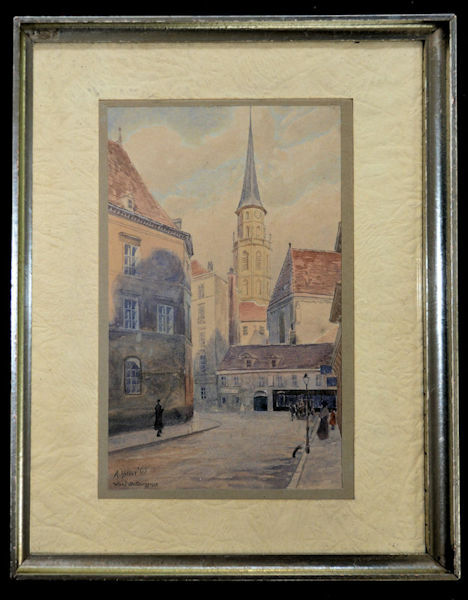 DESCRIPTION: This is the other watercolor painted by Adolf Hitler that we recently obtained. 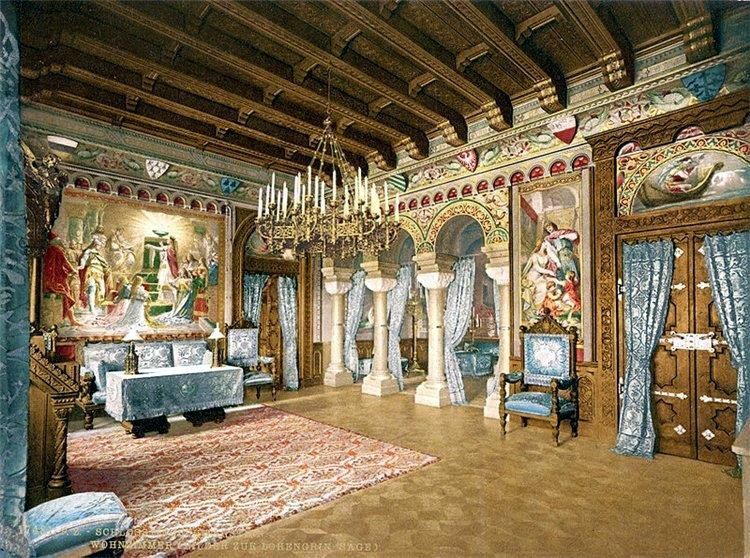 This is the second one mentioned in the article above in the description of the canvas of the castle of Neuschwanstein. 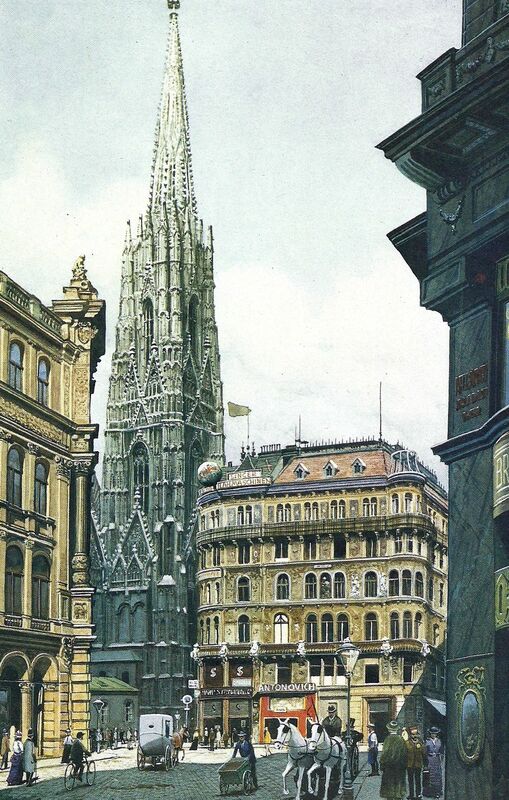 We mentioned in that narrative that there were certain buildings and other pieces of architecture that Hitler truly admired and often painted, and this magnificent depiction of Karl’s Church in Vienna was certainly his favorite subject of all. It shows up in both his sketches and paintings several times among the ones that were found. This piece we offer is a full-blown precious watercolor in all its glory. 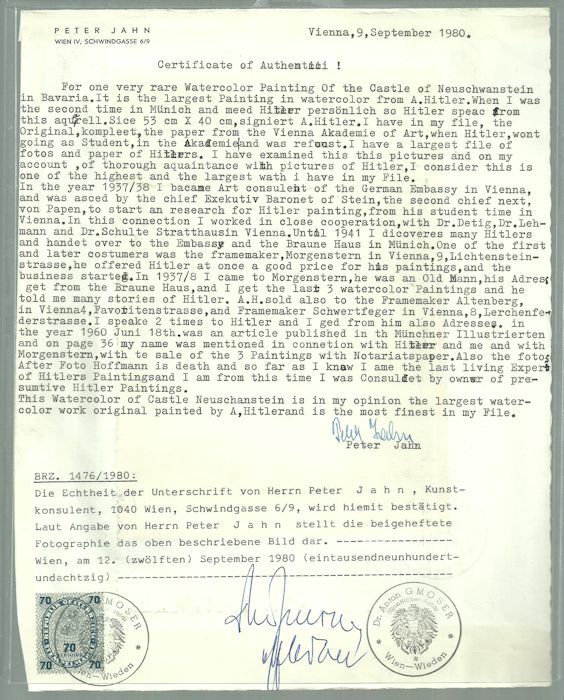 We have mentioned in the article above that only two experts have had proper credentials for authenticating Hitler watercolors and drawings. They are the late Dr. August Priesack and the late Peter Jahn and were the last surviving experts after the war to honestly authenticate a Hitler painting and such expertise from either man is the singular best authentication and support that any purported Führer art piece can carry. Others have also claimed that they can offer authentication. One such ‘expert’ that I would rather term an “X-Spurt” is Herr Hans Horvath also from Vienna. 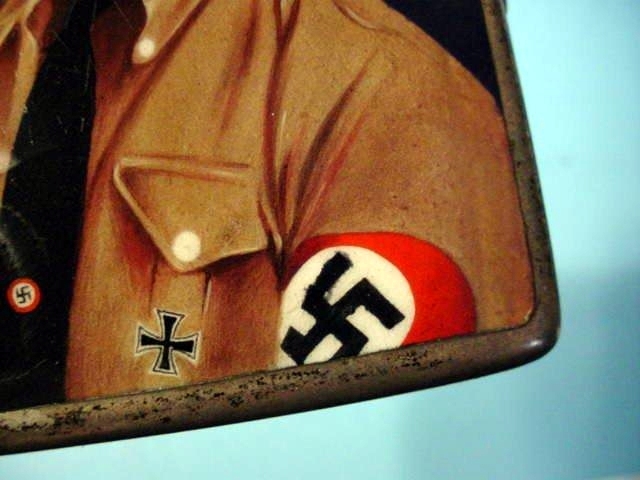 He has built for himself a completely undeserved reputation as an expert in National Socialist paraphernalia and art. 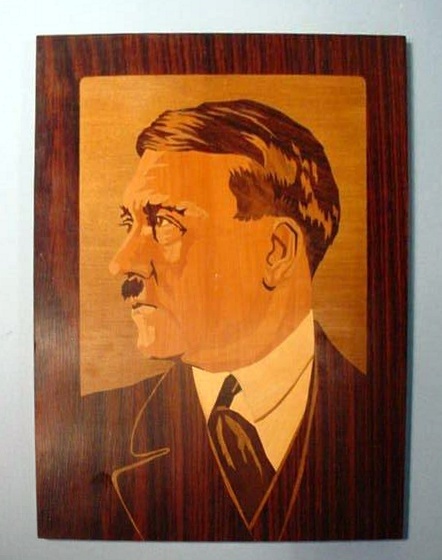 In actuality he is a furniture restorer and perhaps he is good at that trade, but in the role of an authority on Hitler art, I think he had better stick to the sandpaper and glue pot. So, in essence, the singular recognized experts in this field remain the late Dr. Priesack and the late Peter Jahn: all others must be taken with skepticism. 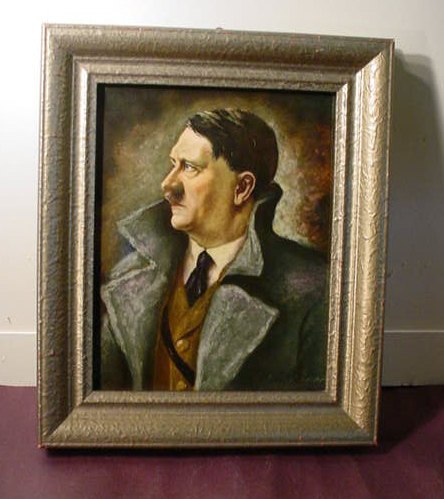 The numerous Hitler watercolors and oils that show up are legion, and serious collectors invariably believe only in the ones that bear the Priesack or Jahn credentials. 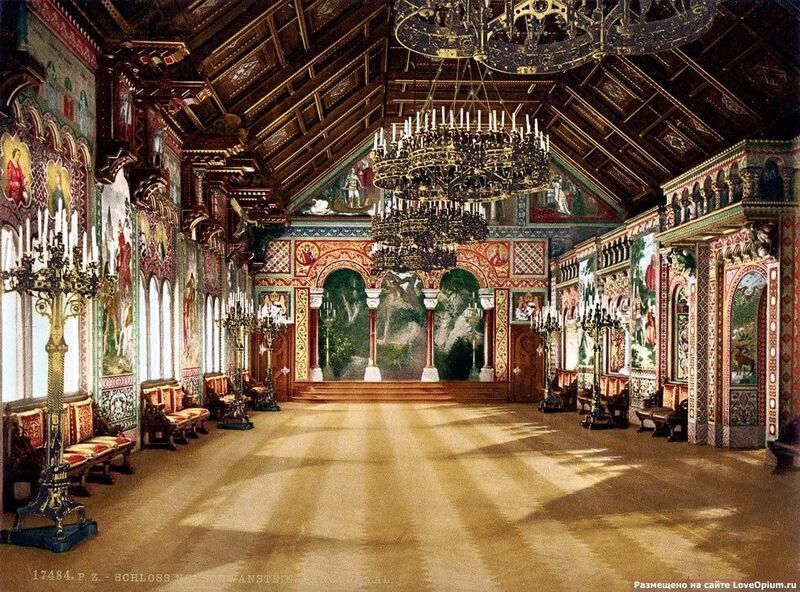 We have explained much about this in the article above regarding the magnificent Schloss Neuschwanstein watercolor. The Karlskirche in Vienna as seen in our accompanying picture just above is also like the other one—accompanied with a provenance and expertise by none other than Peter Jahn with a letter of positive authenticity dated April 19, 1982. 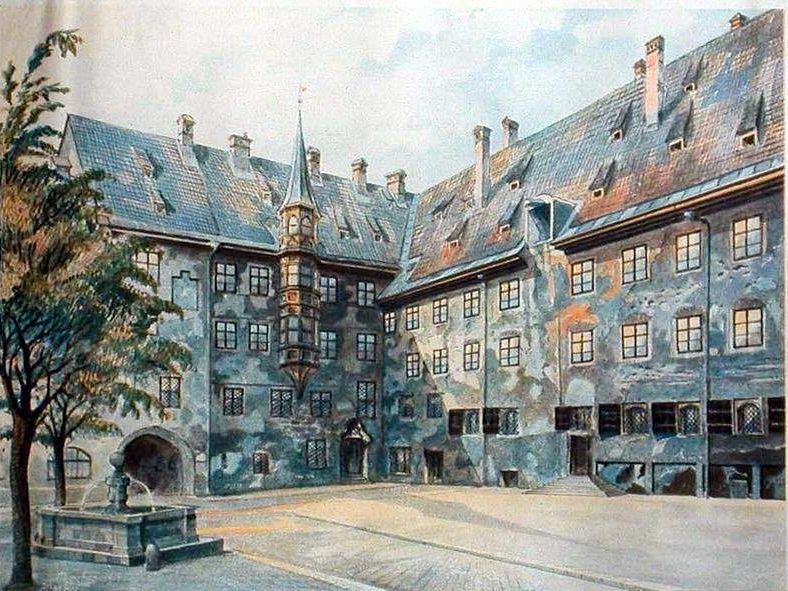 According to Jahn, this painting, like the castle rendering, was also one of the largest Hitler watercolors he’d ever seen. 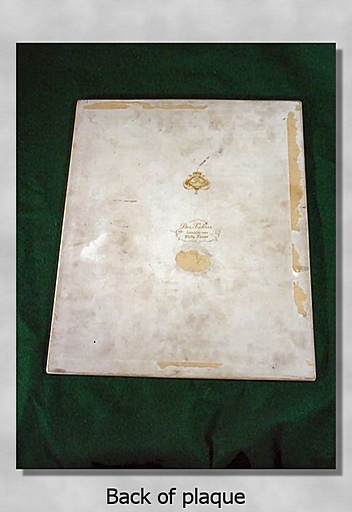 The size is 15.75 x 11.5 inches. 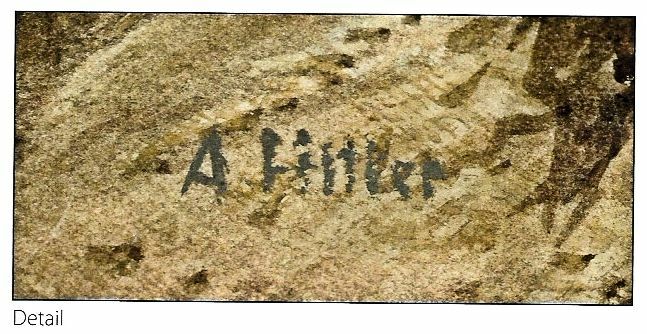 This is absolutely in my opinion as well, one of the most detailed and crisp examples of Hitler’s work ever located and offered. It is definitely done with watercolor and gouache, boldly signed and dated “1912.” It is in fine condition throughout. The great architectural technique is superb and the people in the depiction are somewhat substantial. 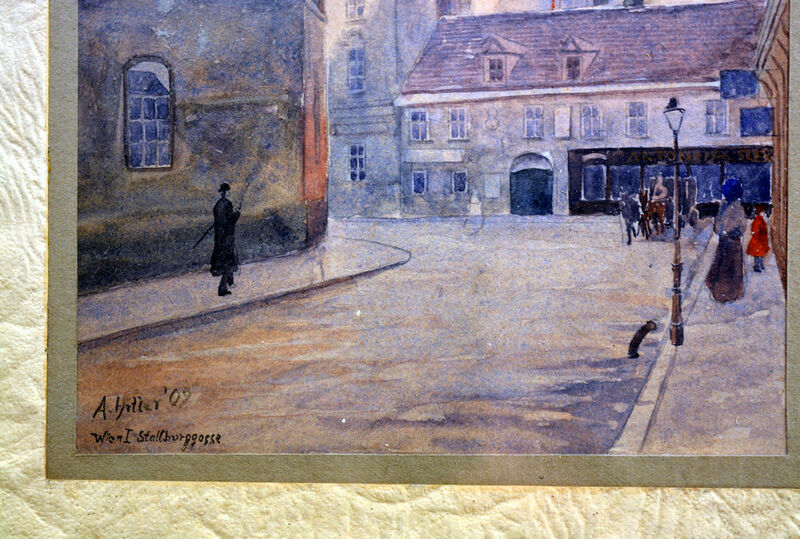 Hitler, jokingly perhaps, often said that his paintings could easily be recognized by their “unreal people;” however, the incredible attention to detail in his landscapes, city scenes, and architectural renderings absolutely abound in realism while unfortunately less apparent in his handling of the human figure. It is obvious in his works that he reached for majesty in some of his art, but he also pictured simple Germanic country scenes, as well. For him, the great structures such as the Pergamon Altar and the Parthenon, both of ancient Greece, and the ancient Roman Pantheon, symbolized for him the dimension and glory of the race he considered the founders and builders of Western civilization—the Aryans. The monumental cathedral constructions of the medieval period, the palaces of the Renaissance and the neoclassical structures of the 19th century were as he often said, “expressions of a cultural community, a heritage to be preserved and perpetuated.” Why did Hitler the purported atheist paint churches and cathedrals? Why indeed? Well first of all, the dubious atheist contention comes from the writings and verbal utterings of the “court historians” who seek always to slander him to the fullest with pompous insolence bordering on superciliousness. They seem duty bound with their chosen agenda to attack every vestige of the man’s very being. Hitler was certainly no atheist. He was raised a Catholic and never at any time renounced his faith. 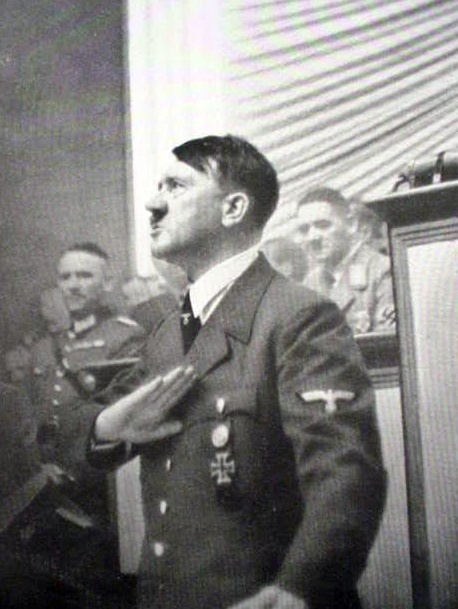 In his book Mein Kampf he proclaimed his Christianity and in numerous verbal pronouncements he spoke of his belief in an “Almighty Creator.” Yes, to some extent, he harbored the anticlerical belief that the church in Rome wielded too much power over its faithful adherents; he disdained “churchology” believing God lives within the soul of man and determines his destiny. He was always in favor of “positive Christianity.” He said in a 1922 speech, “My feelings as a Christian point me to my Lord and Savior as a ‘Kämpfer [“fighter”].” In a 1928 speech he said, “We tolerate no one within our ranks who attacks the idea of Christianity . . . in fact our movement is Christian!” So perhaps this is why he so often portrayed the glory and majesty of churches, abbies, and cathedrals in his paintings both in Germany and Austria. The Karl’s Church in Vienna was, as we said, one of his favorite-subject paintings not only because of its beautiful architectural value, but probably because his youth was spent in the study and admiration of famed saints of the church—as any good altar boy would be proud to do. His appreciation of Saint Charles Borromeo, the Patron of the Baroque, was one of the greatest reformers of the 16th century. In 1713, one year after the last great plague epidemic, Charles VI, Holy Roman Emperor, pledged to build a church for his namesake patron Saint Charles Borromeo, whom was revered as a healer for plague sufferers. 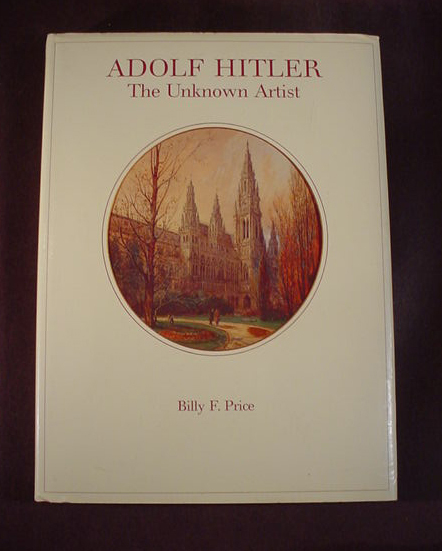 Mr. Billy Price’s book Adolf Hitler: The Unknown Artist depicts numerous churches that were painted by Adolf Hitler. It seems it was his most preferred subject matter and obviously, this says something at least about his very nature and his spirituality. He actually portrayed Karl’s Church in many different views—front, back, sides—over a period of time and he found during his Vienna period of painting that the depictions of this building sold by far the best to the public whom he at that time desperately sought to sell to. 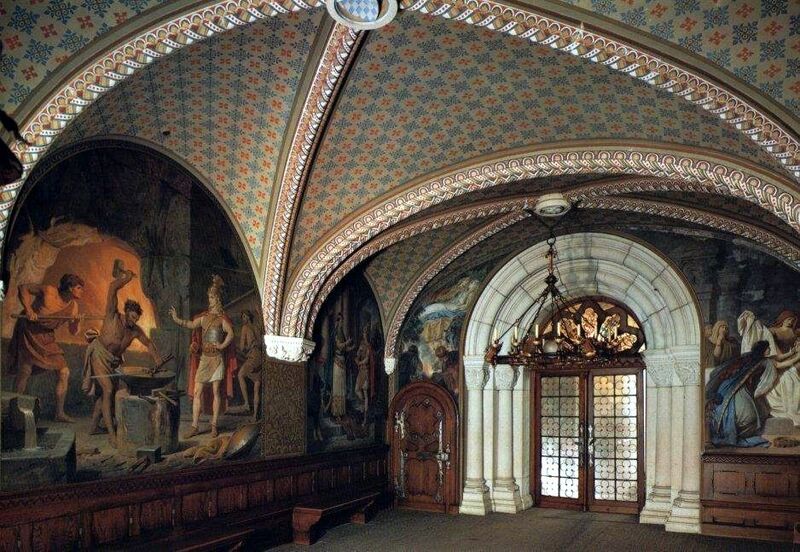 But as to the several churches that he artfully depicted, we know this one by far is the absolute finest! 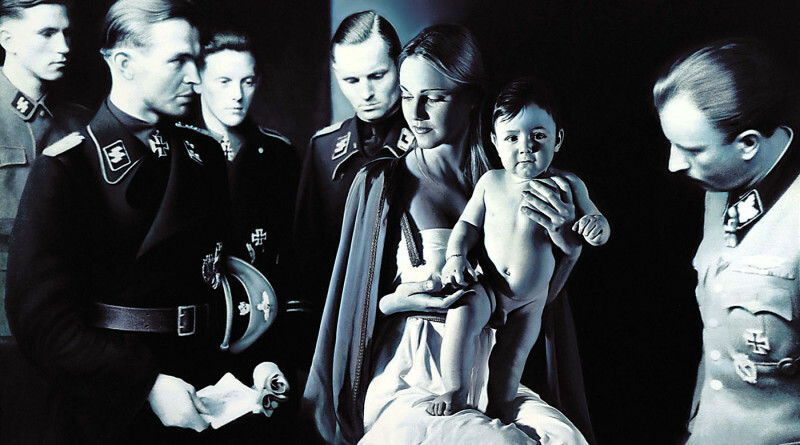 Its brilliance and clarity stand out like a beacon shedding the true artistic light that now goes far to illuminate the intense interest that the future Führer had in all things religious when he was young. It now looms obvious and can be plainly seen in this magnificent watercolor that this must be called a “very significant work” and we know it was painted by this amazing artist whom the autochthonous plebian writers call a “house painter” in their ever-dubious inflammatory writings. So, here is what I would dare to call a “masterpiece” with ironclad provenance and expertise by one of the only two authorities recognized in the art circles for Hitler paintings. This is a golden opportunity to make a very wise purchase that can only increase in value in a very short time. 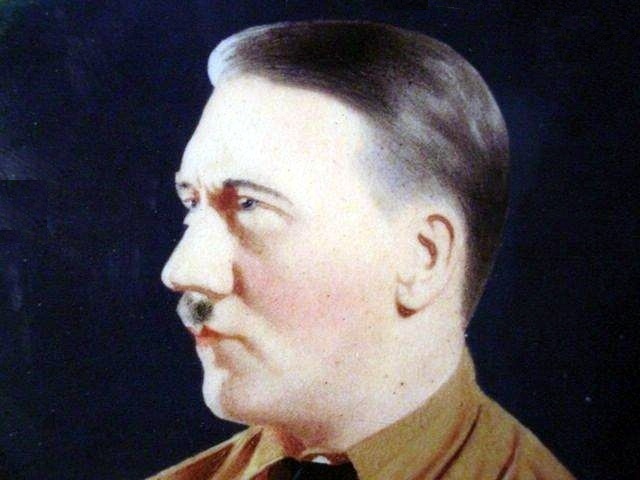 Already, a watercolor painted by Hitler was reported to bring almost $15,000 in an auction on or about April 23, 2009. But, this painting was in my estimation very dismal and dark and reportedly had no letters or documents of authentication or any provenance. Actually, I didn’t even think it was Hitler’s style at all! This story is repeated over and over every year that goes by. The mere mention of anything that Adolf Hitler owned or produced seems to appeal to those who for any reason are so fascinated with him as to loosen their pockets in a heartbeat if the chance to buy something no matter how loose the connection is or how much actual authentication is provided (Barnum was obviously right!). This dubious canvas that brought nearly the $15,000 was sold in England by Mullock's Specialist Auctioneers & Valuers in Shropshire. 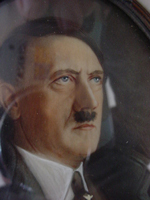 So I repeat again that only the expertise of Dr. Priesack and/or Peter Jahn is accepted today, Otherwise you “pays your penny and takes your chance.” In closing let it be said that if you ever wanted to own the ultimate Hitler item actually produced by this phenomenal man here is the unique opportunity that will be before you in all probability only once! 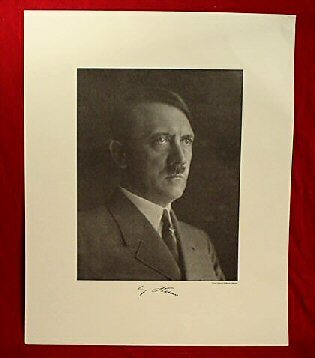 Collectors, please look at what one of Hitler’s watercolors brought recently in Germany. BERLIN (Reuters) - A 1914 watercolour by Adolf Hitler fetched 130,000 euros ($161,000) at auction in the German city of Nuremberg on Saturday, the auctioneers said. The buyer was a private person from the Middle East who attended the sale in person, said Kathrin Weidler, head of the auction house. She said there had also been inquiries from Asia and America. 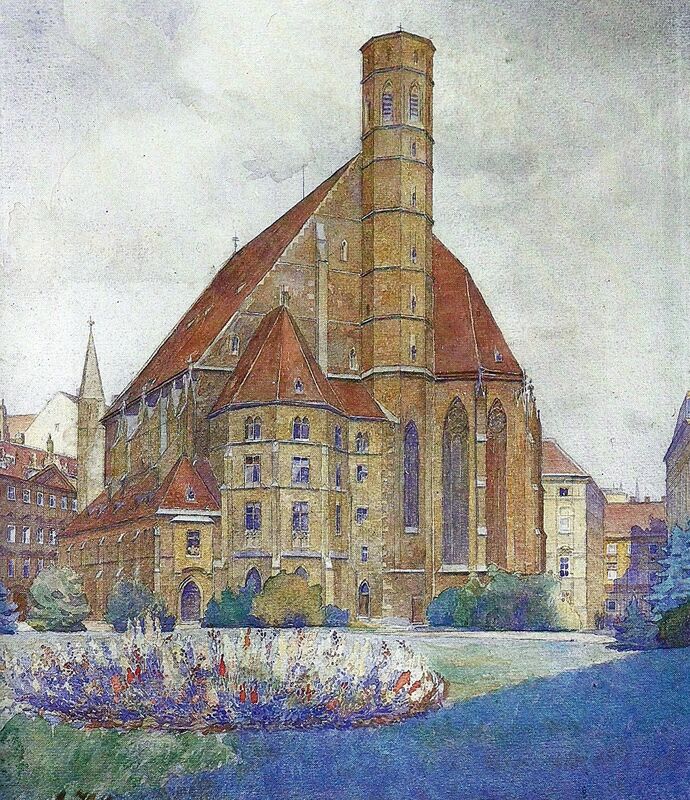 The painting, entitled "Standesamt und Altes Rathaus Muenchen" (Civil Registry Office and Old Town Hall of Munich), is one of about 2,000 works that Hitler painted between about 1905 and 1920 as a struggling young artist. Weidler said the vendors had decided to donate around 10 percent of the proceeds to a charity that helps disabled children. 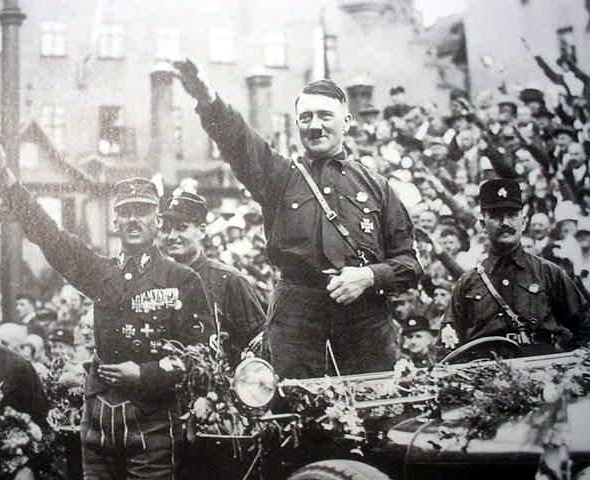 Hitler's Nazi party held mass rallies in Nuremberg between 1933 and 1938. 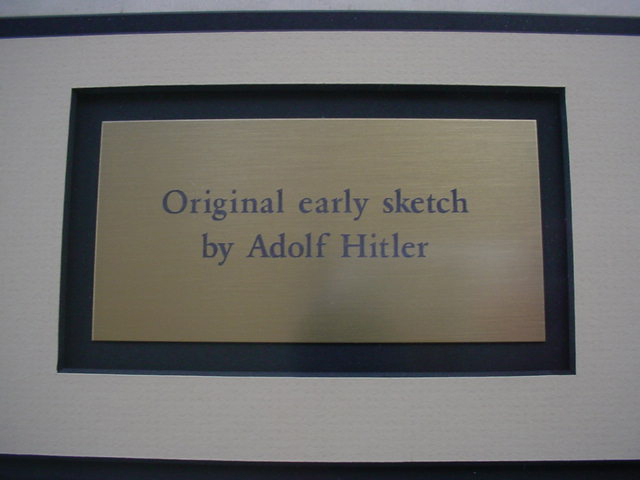 In his autobiography "Mein Kampf", he wrote that, as a young man, his hopes of becoming an artist had been dashed by rejection by Vienna's Academy of Fine Arts. 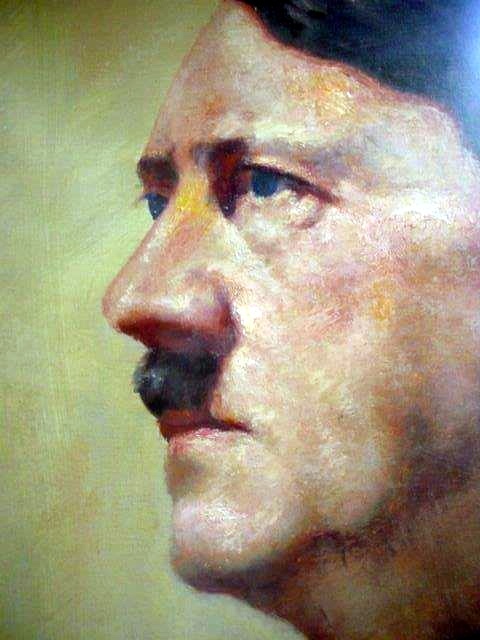 Five other Hitler paintings have fetched up to 80,000 euros at auction. 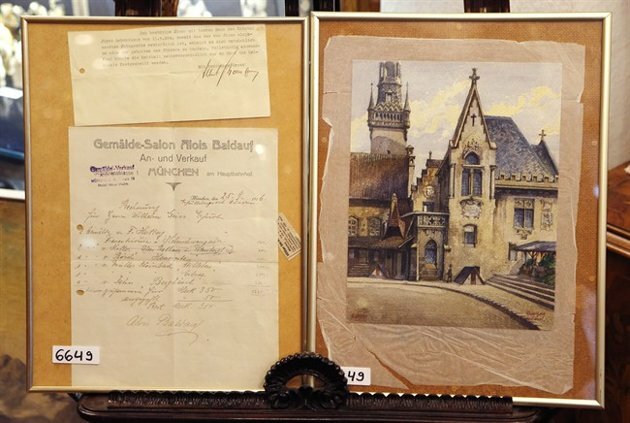 Weidler said the original handwritten bill of sale, dated Sept. 25, 1916, had come with the painting and was a rarity for Hitler's art. That also explained the relatively high selling price, she said. "Art is Going the Reich Way"
Perhaps it is a yearning for old values; on the other hand it could be an instinct for impending change ~ or a nose for a fast buck. Whatever it is, demand for Reich related objet d’art, books and art is building up a head of steam. The Third Reich period was legendary for more reasons than the Allied inspired war that destroyed it. 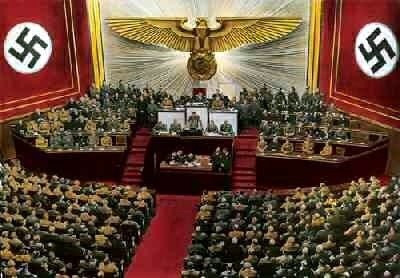 Hitler’s Germany, between January 1933 and May 1945, introduced great change in design, fashion, invention, progress and art. Such achievements were matched only by Ancient Greece and the Roman Empire. 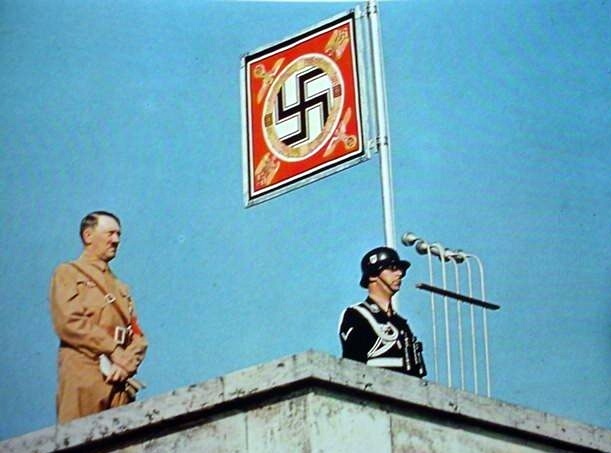 The concept of National Socialism that revitalized the German Reich was stalled in May 1945. Nevertheless, much of Gottfried Feder’s blueprint for national renaissance has since been plagiarized by emerging nationalistic nations like Russia. 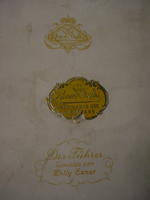 The 70-years copyright on Reich literature bequeathed to the State of Bavaria has now expired. It is expected that many books extolling the virtues of the Reich will soon be published to meet demand. The current hot favourite that has investors falling over themselves is art that found its origin in the Third Reich. Throughout Europe and the United States art collectors now pay premium prices for art works that, until a short time ago, were shunned. A favourite Jewish catchphrase is ‘cash is king’. Well, it is cash that now lures auctioneers out of their lairs. 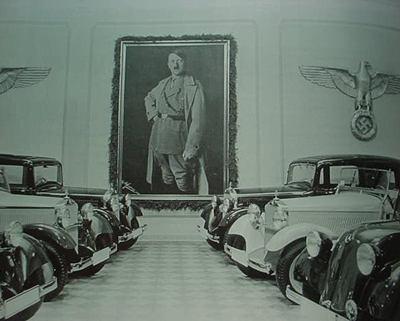 Until recently the auction houses were loath to touch the ‘tainted bi-products of Hitler’s Germany’. Today, the United States, Britain and France are awash with looted Reich artifacts. Is plunder about to pay off? Maryland auctioneer Bill Panagopulos concedes that ‘the major auction houses won’t touch these (Reich) artists due to their acceptance by and collaboration with the Nazis’. Changing his tune he now says that there is now a growing market which cannot be ignored. Such works of art today command high prices. The auctioneer’s gavel raps harder when hands are raised higher. “This is only the beginning,” Martens says. 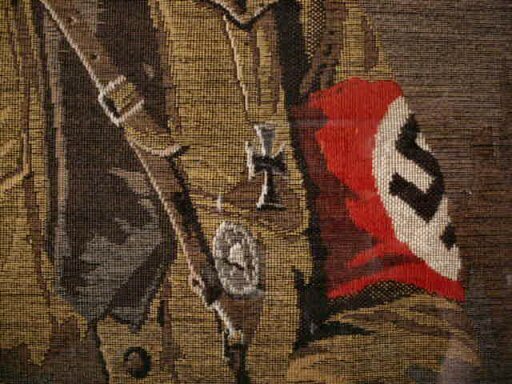 The appeal of Third Reich artefacts and art works is now seen in auctioneers’ catalogues. There were four gates that were entrance points of the old walled city. The Karl’s Gate, the Sendlingern gate, the Schwabingertor and the Isator. 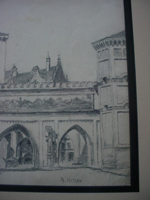 Only the Schwabingertor is no longer there (demolished at the beginning of the 19th century). The famous Feldherrenhalle stands at that site today. In 1984 Billy V. Price of Texas published a book on Adolf Hitler’s art titled ‘Adolf Hitler the Unknown Artist.’ In this beautiful edition he shows many Hitler oils, watercolors and sketches done by Germany’s future Fuhrer in his early years. 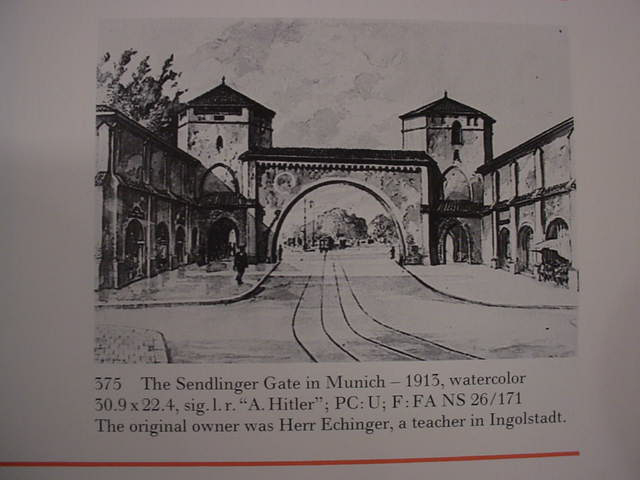 It is interesting to note that Hitler was somehow inspired by these Munich gates and often portrayed them in his art renderings. 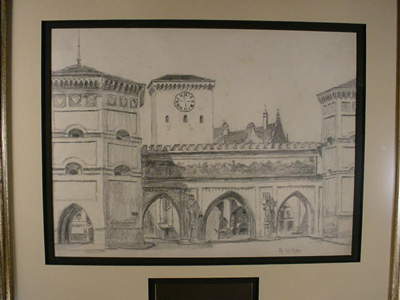 In Price's book there are several depictions in sketches of the Sendlinger Tor, and the Karlstor but none of the Isator. 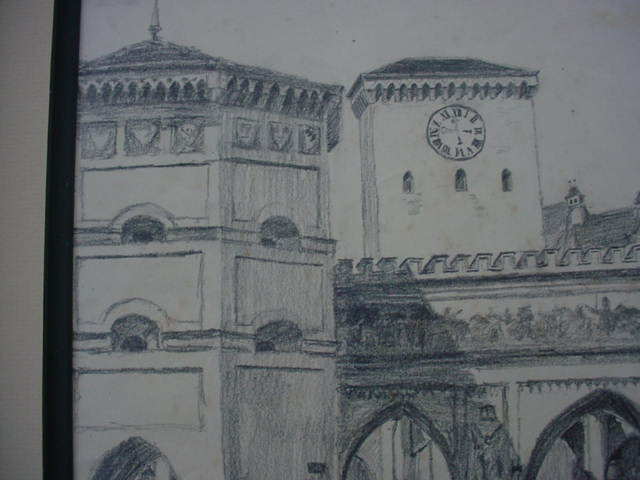 Now it only stands to reason that he would have sketched the three gates that still existed in his time. 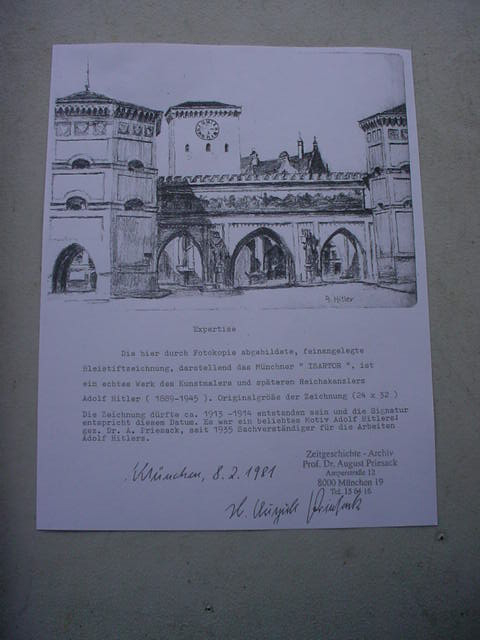 When one observes the watercolor of the Sendlinger Tor on page 175, at the bottom of the page you can sense the identical style as seen in the sketch we offer here. We believe we have turned up the missing gate by A. Hitler. So here we proudly present the Isortor and with this rendering is an official provenance dated August 2, 1981 by Professor August Priesack. This man and one Herr Peter Jahn of Vienna (both deceased) were the only reliable persons who were known and trusted researchers of Hitler paintings and sketches. 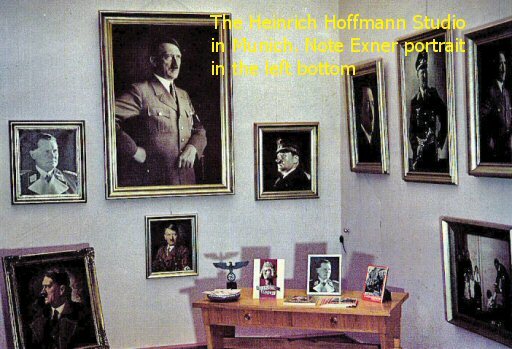 Herr Jahn was a noted authority of Hitler’s art and actually was employed by Reichskanzler Hitler when in 1935 a systematic search for Hitler’s art was given an official status by the historical research division of the NSDAP central archival authority. 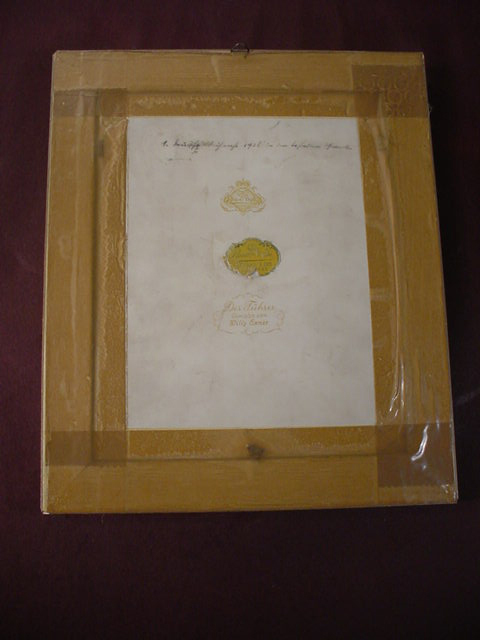 Jahn was given the task of recovering Hitler’s works of art. 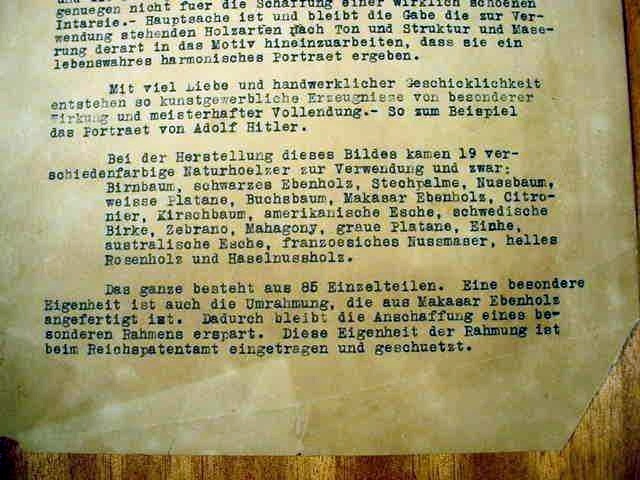 This so-called ‘secret section’ was exclusively involved in researching Hitler’s past. Two archivists Wilhelm Dammn and Dr. Professor August Priesack worked together and were responsible for authenticating all Hitler art that could be purchased or borrowed. The actual search for the artworks was carried out by the staff members under the departmental jurisdiction of Hitler’s deputy, Rudolf Hess. When a painting or drawing was located, the staff’s cultural attaché Dr. Ernst Schulte-Strathaus turned over the work to Herr Dammann and Dr.Professor Priesack for thorough examination. 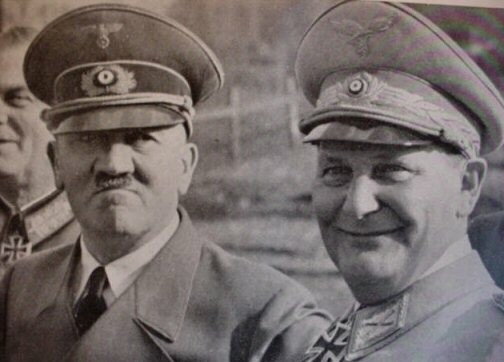 Two years after the Munich team of Dammann and Priesack had begun its work the Chief Officer of the German Embassy in Vienna Baron Otto Von Stein contracted the Viennese art historian and dealer Peter Jahn at the behest of Adolf Hitler and the NSDAP and requested his help in locating those of the Führer's works done in Austria. 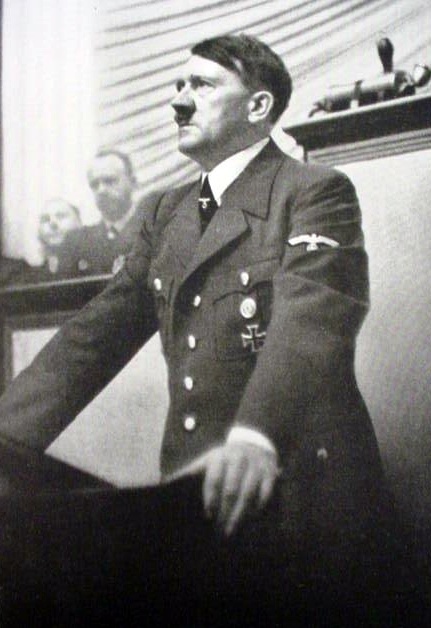 Herr Jahn took the assignment and on two occasions personally delivered paintings to the NSDAP headquarters in Munich where he met Hitler and discussed art and Hitler’s early experiences in Vienna. Before his death Dr. Priesack had accomplished significant research in the field and possessed the largest collection of documentation on Hitler’s art in the world. With Peter Jahn these two men were considered the last surviving experts on the authentication of Adolf Hitler’s art. Without the accompaniment of provenance of either of these two historians and researchers one can never be quite sure of the authenticity of Hitler’s paintings or sketches. 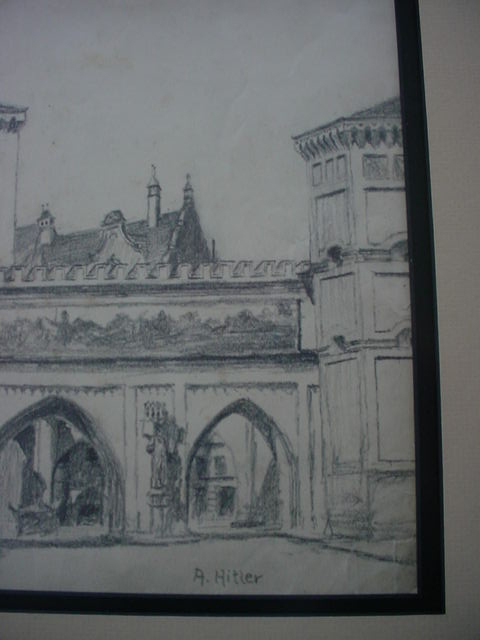 “The above is a photocopy that shows a finely executed pencil drawing, of the stable-end of the Munich Isator and is a genuine work of the artist Adolf Hitler (1889-1945) the original size is 24 x 32 (cm). This rendering was originated circa 1913-1914 and produced when his signature corresponds within this date. 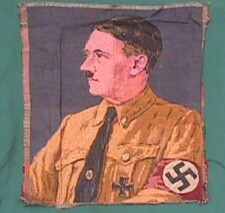 This was a favorite motif of Adolf Hitler. 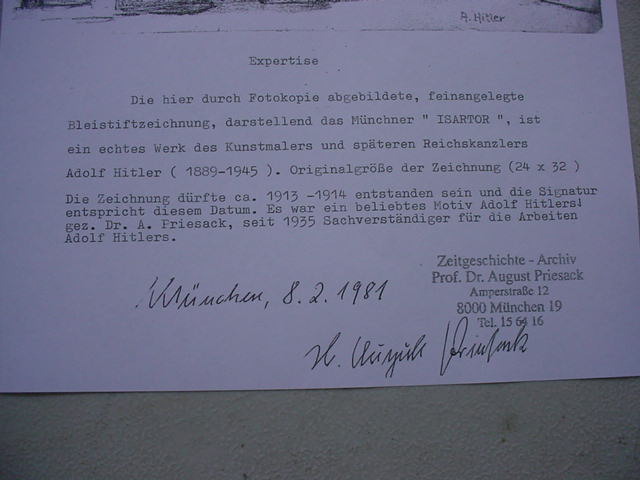 Offered by Dr. A. Priesack since 1935 specialist of or the works of Adolf Hitler (Munich 8.2.1981)." 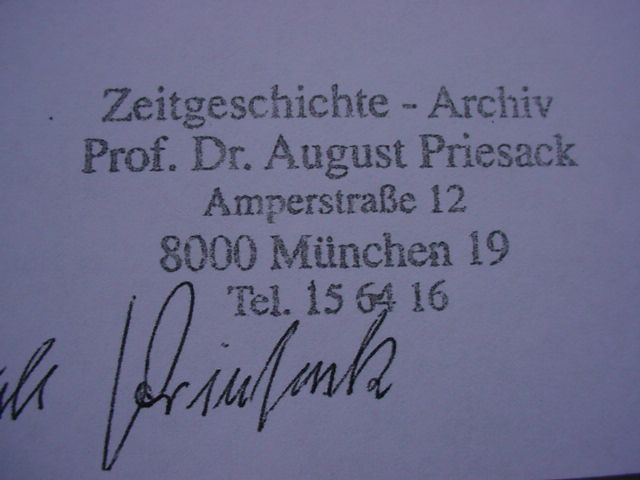 Dr. Priesack's archive stamp also appears with his former office address, and it of course signed in hand by the professor. 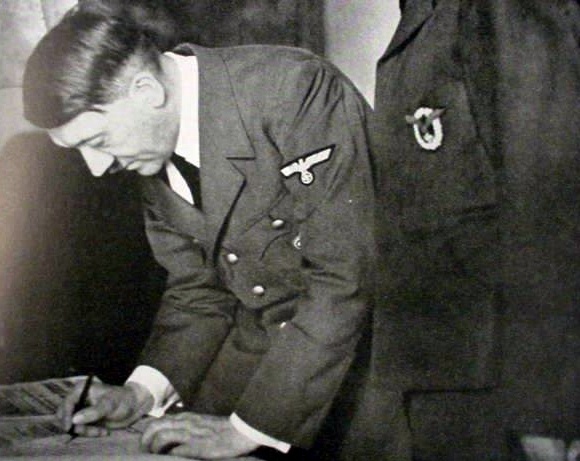 The Hitler signature is just as the Herr Professor has indicated, correct for that early time in Hitler’s life. The sketch is nicely framed and matted on a special hand-made frame measuring 18 ½ by 29 ½ inches. The actual drawing is about 12 inches by 10 inches mounted and matted. 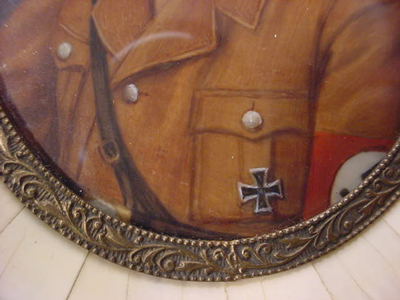 Within the frame is a 6 ½ x 8 ½ copy of an early picture of the young Hitler. The drawing is museum mounted (not glued) inside the frame and the glass is of special non-glare construction that makes the glass virtually invisible with UV filtering. The matting is expertly done with expensive craft paper and the sketch is deeply set to avoid contact with the glass. Spacers were utilized. The result is that the artwork looks to be floating in the frame. This is the most desirable method when framing an important art work such as this. The framing of this sketch was done with absolute mastery of the framing art. A copy of the Preisack letter is in a pocket on the back of the frame but the original letter goes with the purchase of course. 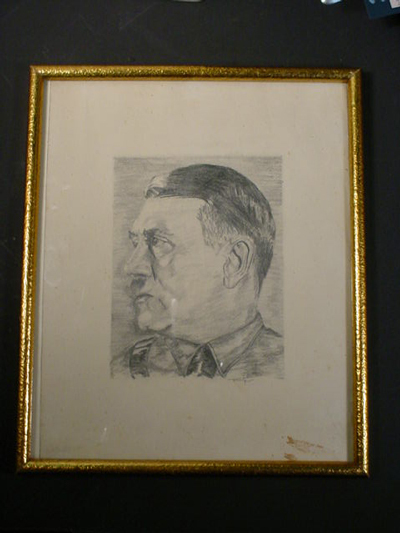 Here is a rare chance to own an authentic drawing by the 20th century’s most famous world leader. A man whose watercolors are highly sought after and bring “astronomical prices” while the renderings of Winston Churchill (who fancied himself an artist and ‘Ike’ Eisenhower’s paintings bring very little on the art market) but before anyone jumps to the conclusion that it is only the morbid collector who would collect Hitler’s paintings and drawings because of his so-called “evil image”-(debatable!) Think about war criminal Churchill’s orders resulting in the genocide perpetrated against the thousands of innocent people of Dresden and “Ike’s outright heinous genocidal order murdering nearly a million German POWs in the prisoner of war camps along the Rhine in 1945. (Please read David Irving’s “Destruction of Dresden” and James Bacque’s, “Other Losses” available from Amazon books on the internet). Adolf Hitler was in fact a darned good artist while Winnie and Ike were less than mediocre as painters. DESCRIPTION: This is a German tradition that goes back for centuries. It became customary to encase hand painted portraits on elephant ivory of famous personages in frames that were constructed also in genuine ivory. The ivory was fitted by hand from plainchants that were usually purchased from piano manufacturers and as you can see some of the pieces were the size of piano keys. 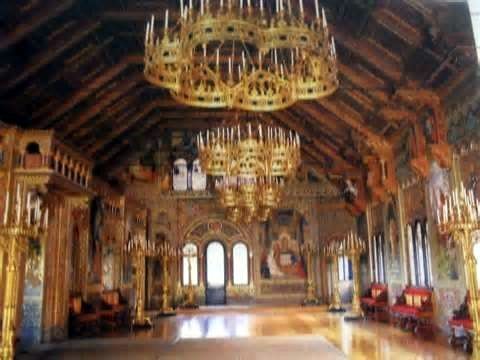 See our Fredrick the Great section where you will see more of this particular art form as historically used. The frame measures 4 ¾ x 6 inches. 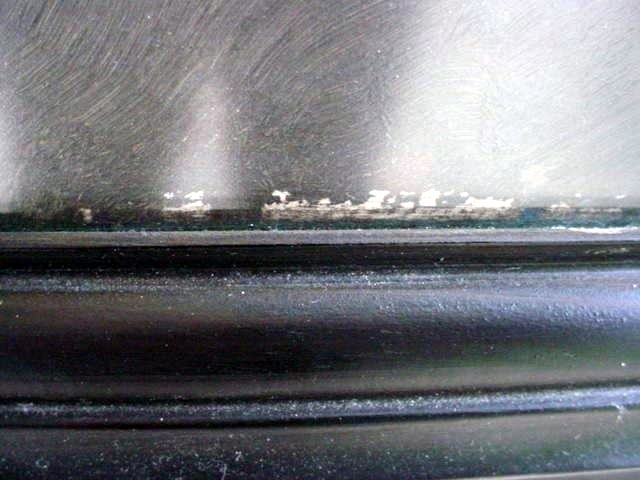 The picture with the inner copper bezil measures 3 ½ x 2 ¾. 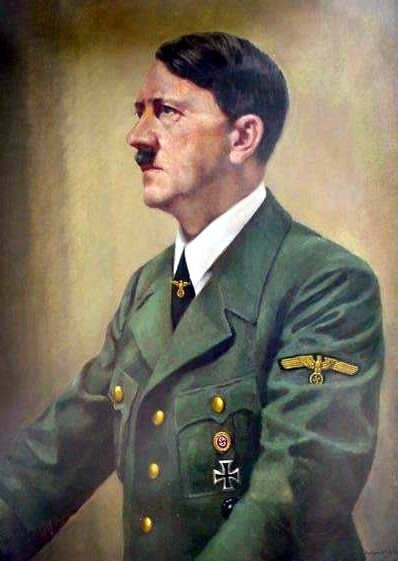 The likeness of the German Fuhrer is no less than astounding! 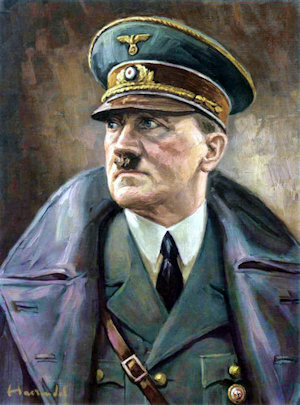 In artistic presentation it depicts him as he looked shortly after his assumption of complete political power in 1933. He wears the famous overcoat that he wore all during the Kampfzeit (the struggle for power). His ever penetrating blue eyes are fixed upon Germany’s future and the entire countenance is strong yet deeply inspirited. The tones and detail are fabulous as the depiction captures the depth and perception of the man who Time Magazine called the Man of the Year in 1933 with his picture on their cover. He beat out Roosevelt who also was elected in that year. This is not only an art treasure, but a prodigiously important piece of history (completely unique!). DESCRIPTION: This is an extremely fine hand painted rendering of the Fuhrer intricately executed to the furthermost artistic degree of detail. 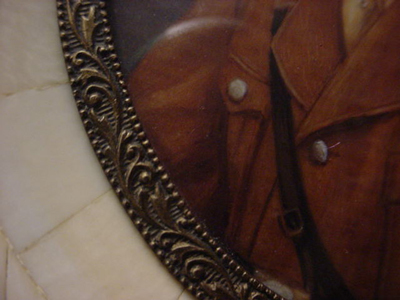 The painting depicts him in his brown political uniform. This was the official state service dress that he wore after his elevation to Reichs Chancelor in 1933. He daily wore an outfit like this until the first day of the war breaking out in 1939 and thereafter he wore the field grey uniform until the end. 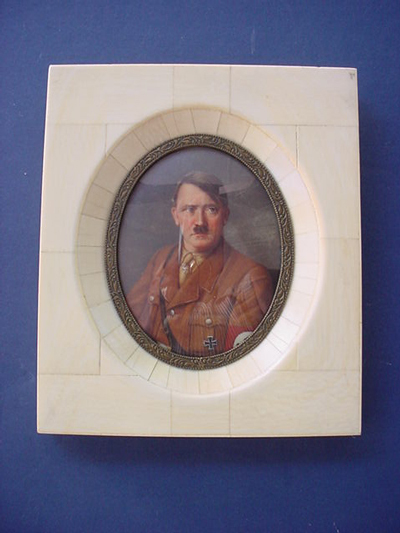 It has for centuries been a German tradition to do hand paintings of famous leaders on ivory plainchants such as this. Generally the best of them were also framed in ivory as well as is the case here. Companies that made ivory piano keys would often sell excess ivory material to the artists who then would painstakingly fit the pieces together to create a beautiful frame to significantly contain the portrait. 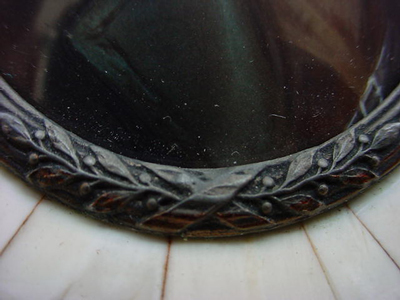 Sometimes silver was also utilized but the one we offer here is purely ivory throughout with the only other material used being a beautiful brass bezil that traces the outline of the picture. 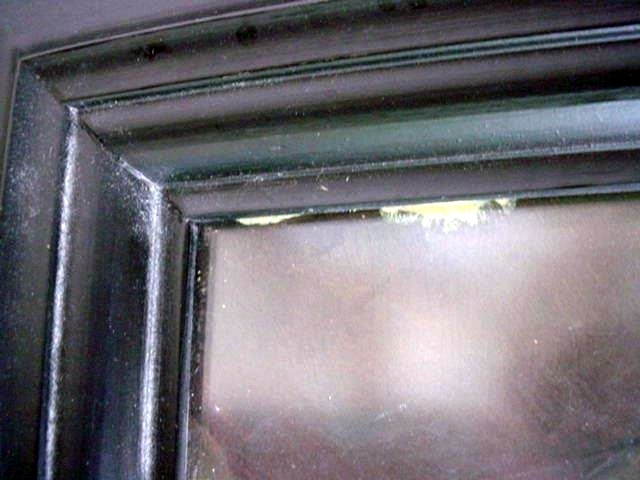 A ‘bubble’ surface glass cover is used over the rendering. 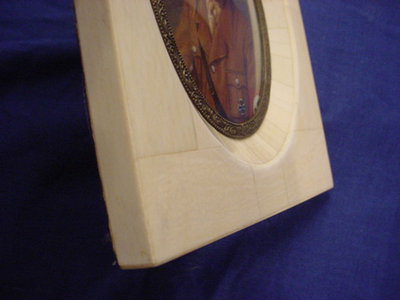 The frame measures 5 ¾ inches x 4 ¾ inches. 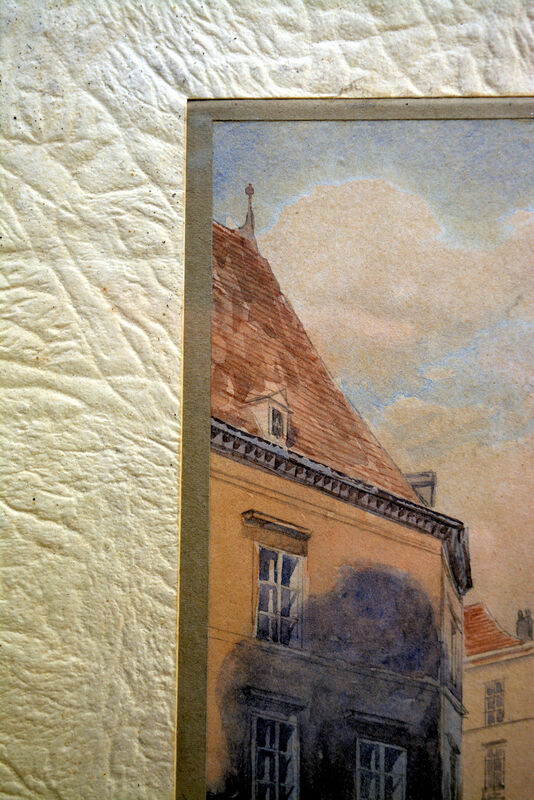 The painting is measured at 2 ½" x 3 ¼". 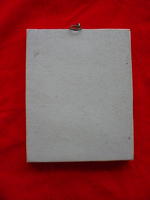 The ivory frame is about ¼ inches thick. 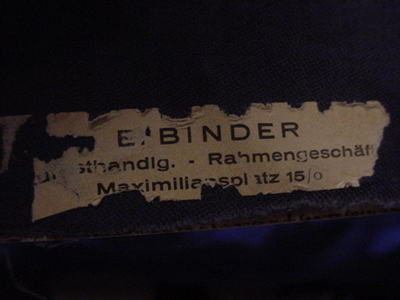 The back is covered with a dark grey fabric material and there is a small label that reads: G. Binder in the MaximillianPlatz and in German it indicates that Herr Binder was a framemaker. Different than most miniature ivory portraits, this frame supplied has a mounted stand up bar on the back to facilitate its standing on a table or desk. But there is also a ring in case the owner might prefer to hang the portrait on a wall. The artistic craftsmanship overall is exquisite and the portrait is utterly phenominal. The artist brings out dramatically the countenance of Germany’s Leader in brilliant detail that could not be surpassed except for one example of one in silver framing that Germania will acquire soon. These miniatures are so rare that we will immediately book flight to Germany if necessary when we hear of one that might be for sale. That in fact was the case with his one. We decided we would not lose it. So off we went and of course combined the quest with buying other great relics but this miniature was the main reason for the trip. (It is that good!). 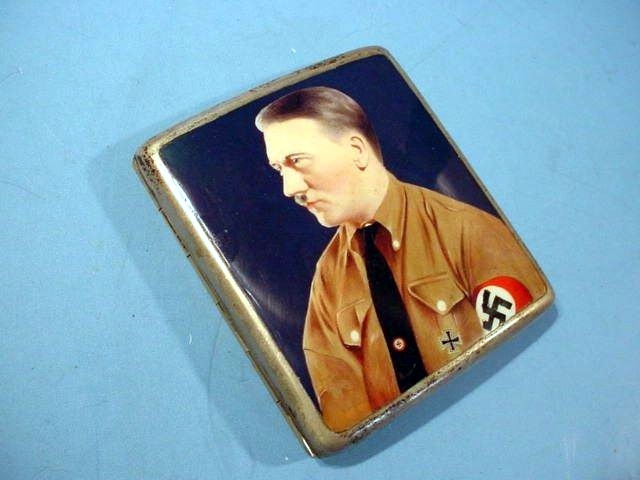 If one would wish to have just one important Hitler item, this would certainly be a wise chose. PRICE: $2,500.00 but if the art world were at all sane today then it certainly should bring more than a Picasso, right? DESCRIPTION: This is an incredibly fine and true to life rendering of Adolf Hitler in the time of the (Kampfzeit) struggle for power. This is a period piece done in 1935 as is indicated on the back. There is writing in German there but I can’t distinguish its meaning. It is old writing and partially obliterated through time but the 1935 is bold. Remember, this is an original drawing from the actual time of the Third Reich; very well presented and historically important for certain. 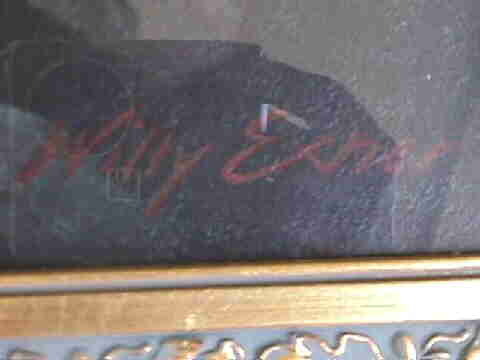 It is signed but I can’t make out the name. 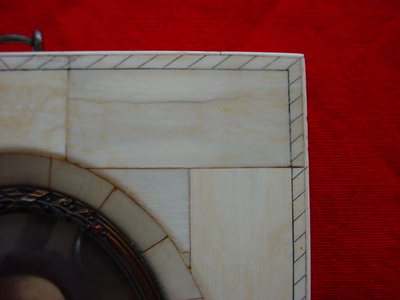 The frame is original to the piece and measures 9 ¾ x 12. The actual drawing is 4 ¾ x 6 ½. I can’t say enough about this item; it is a pretty good work and belongs in a good collection or museum archive. 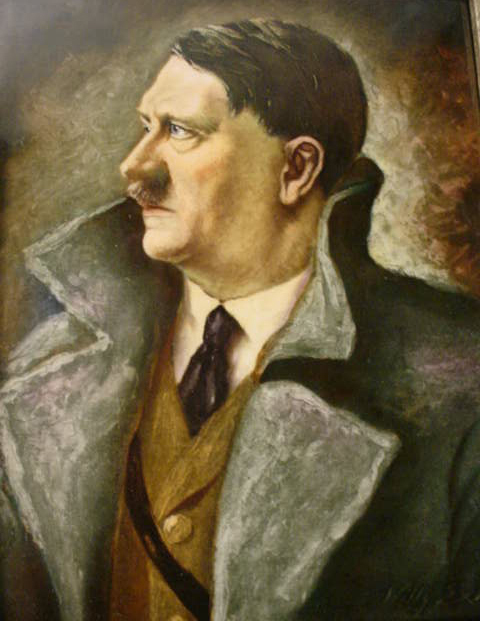 DESCRIPTION: Here is a portrait of the Führer at the height of his power wearing the famed great coat. 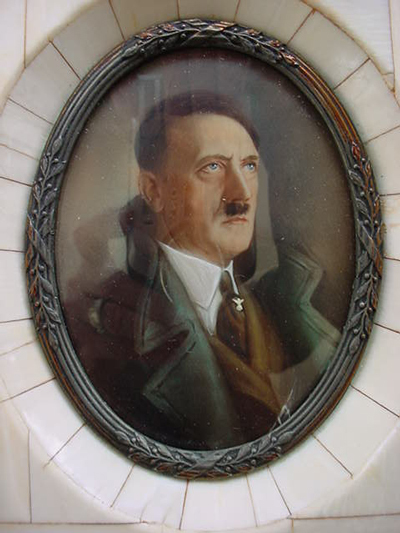 The painting was officially the state portrait and hung in public buildings, schools and official offices throughout the Reich. 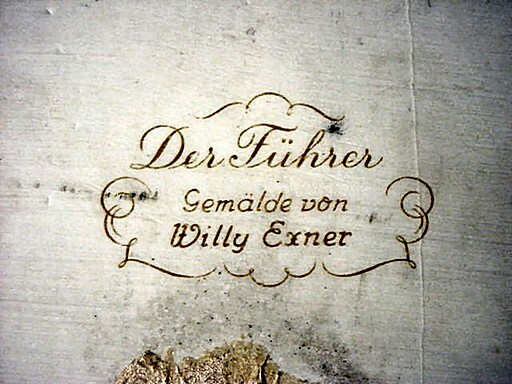 Willy Exner was said to be one of the favorite artists of Hitler himself. The finished portrait certainly brings out the determination and resolve of the man. See also the larger Exner piece at AH 22-2. This smaller rendering has its original frame as supplied with the porcelain by the Rosenthal Company. A website identified as “Ruptured something or another” said that these pieces were sold unframed and it was left to the buyer to frame them. This is only partially true. They were sold unframed or framed with the buyer having the option. 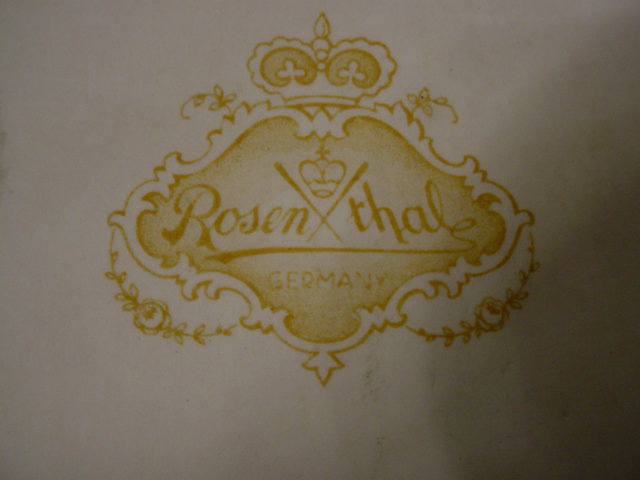 In this case the one that we have is in the distinctive Rosenthal frame. It measures 7 inches wide by 9 inches tall by itself and with frame it measures 10 ½ x 13. The Rosenthal Company that is now in New Democratic Germany doesn’t like to admit that they produced these and that they were the most popular porcelain item that they ever made (ever!). 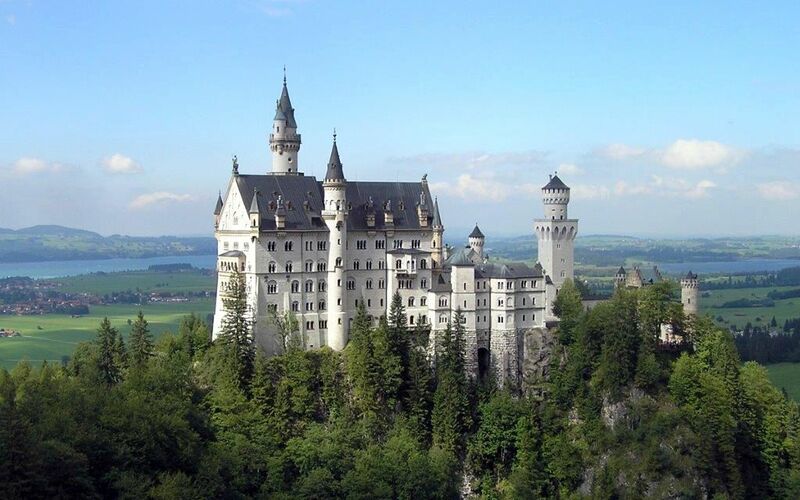 Most of them were destroyed after the war and these are quite rare today. 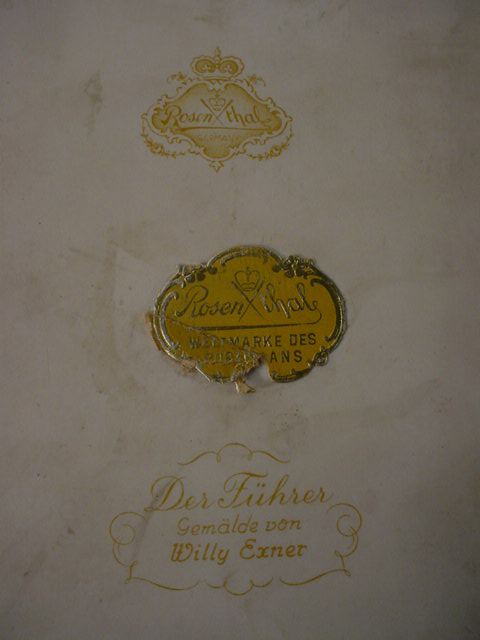 The back of the plaque has the Rosenthal emblem in print and also the Rosenthal sticker slightly worn and the title – Der Führer Gemalde von Will Exner. (Painted by Willy Exner). 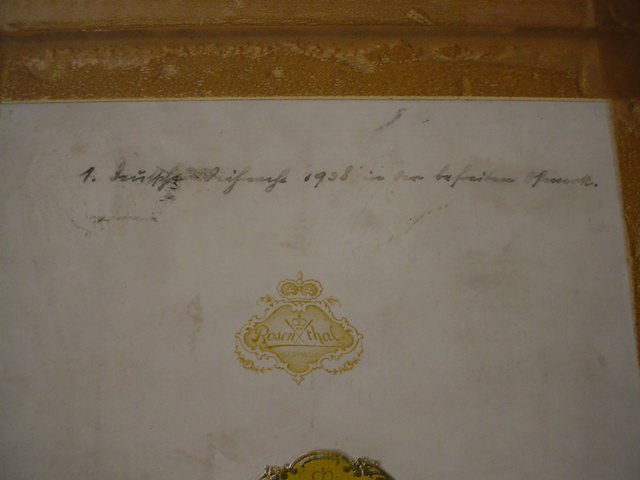 Also someone back then wrote in German -- Deutsche Weihnacht 1938 in Der Befreiten Ostmark. 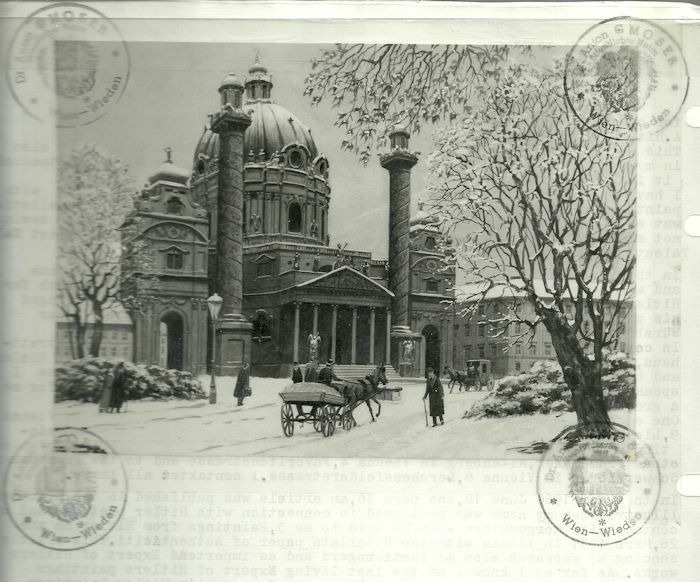 This translates to Germanic Christmas 1938 in liberated Austria. Austria was annexed to Germany 12 March 1938 due to a popular plebiscite of 73% or more of the populace who were overjoyed to be able to once more be part of the greater German Reich. Most actual records of the time show that it was by a plurality of over 90 %. Flags, books, gifts of all kinds with swastikas and especially items with the likeness of the German Führer were produced and enjoyed and treasured by the joyful people of this Ostmark, this brother land! DESCRIPTION: Here is what I would call the “ultimate in a Kampfzeit articles” (Kampfzeit = Time of Struggle). 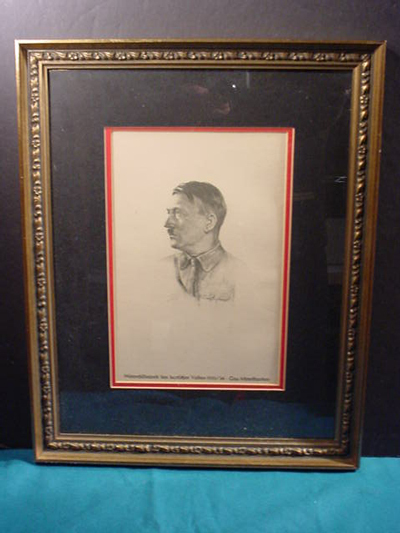 Here is the depiction of the man who would rise to Führer of his nation and is pictured as he looked in the 1920’s—about the time of the famed “Beer Hall Putsch.” Because of the artistic mastery of the artist, he has captured all the resolve and determination of this man, whose march to destiny could not be curtailed until it was finally met in 1945. At this point, however, he was the struggling revolutionary who was dedicated to awakening his nation to the dangers it faced from international communism. Deutschland Erwache (“Germany Awake!”), this motto of the NS party, was proclaimed now from the Rhine to the Elbe. We present now this extremely rare pre-1933 fine, artistic accomplishment. 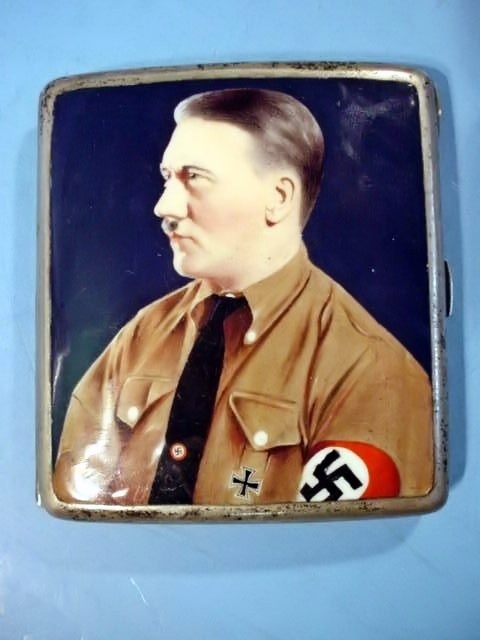 It would not have been painted on a cigarette box after 1933, as smoking was highly discouraged and even forbidden in party circles once the NSDAP was in power, and a cigarette case bearing the likeness of the Führer? Never! So, you can see how utterly rare this object truly is. 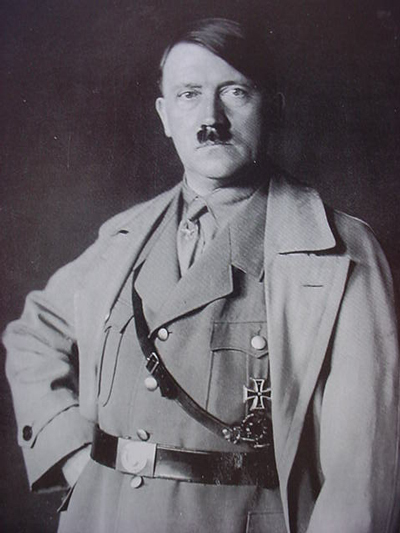 This man’s mission, as he saw it, was a great crusade to bring Germany into the halls of an Aryan “Imperium” and he almost accomplished it! His is the story of an almost impossible rise to greatness from virtually nothing, yet he was destined to become the most powerful individual that the world has ever seen or probably ever will; however, here he is as the young rabble rouser—as his enemies called him. He is seen in the brown shirt and N.S. armband, and this was his outfit of the 1920’s and early 30’s. These were the days of the fierce street battles between his brown-shirt SA (Sturmabteilung) “Storm Troopers” and the red rabble of the murderous 'Rot Front' gangsters. 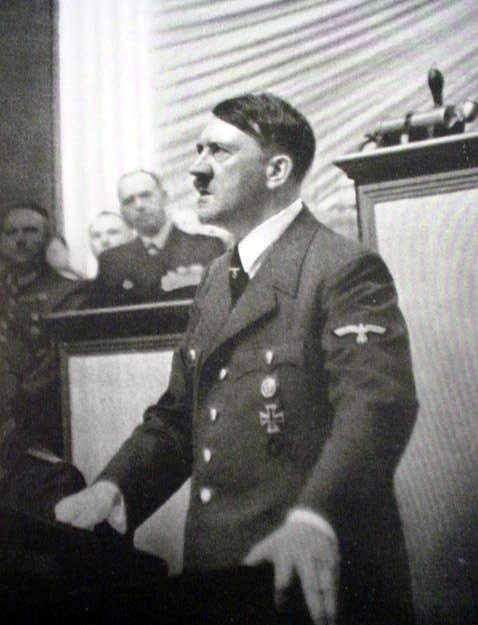 This was the “make or break period” and Hitler persevered when all seemed hopeless and lost; finally, in 1933, it all emerged as worth all the struggle and loss–Germany was awake! 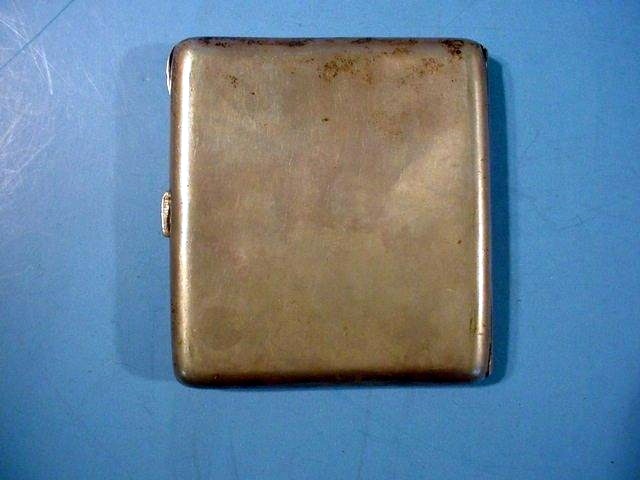 The case is made of alpaca silver and is so marked. Alpaca is otherwise known as German silver and the word “Alpaca” is so marked inside the rim. 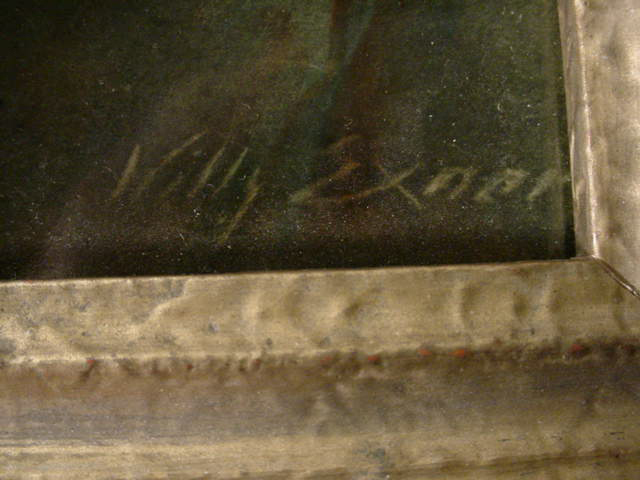 The painting is in fine shape with the slightest of scratches visible only under magnification. The case measures 3 x 3 ¼ inches, which is the standard size for a cigarette box of that time. The case closes tightly shut with an audible SNAP! 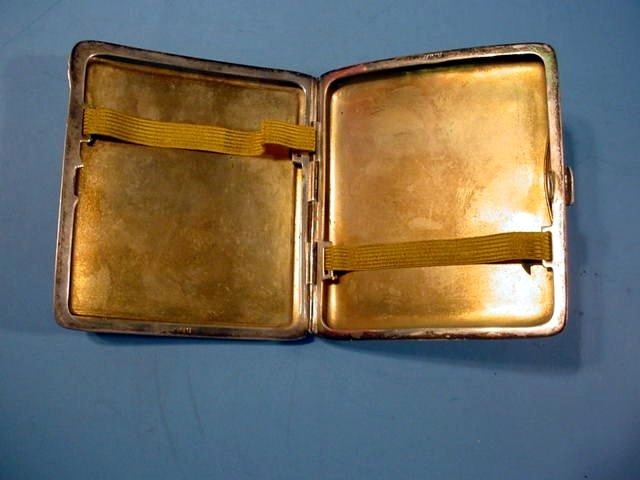 There is a curvature to the case just as the best of these cases were constructed to fit the curvature of the body of the person who carries it in the shirt or hip pocket. 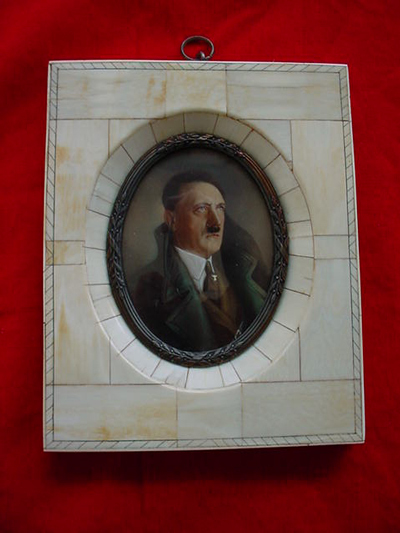 As Hitler-related items go, I would have to say that this one is not only unusual and rare, but prodigiously important to contemporary history, as well. The excellence of the hand painting is obvious and this iconic image is something very special. Wunderbar! There are 86 single pieces and the framing section is made from aged Mackasar ebony and this art piece was registered as an official Reichspatent; in other words, a “National Treasure” of sorts. 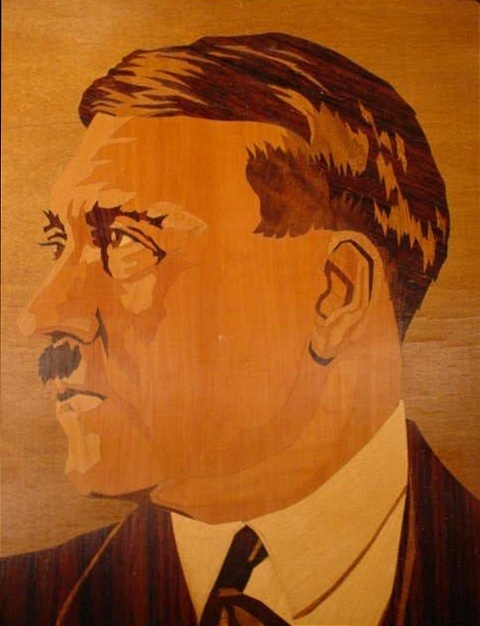 The description above starts with the statement that the project was begun with much love and handwork, excellence, and dedicated to the subject of the portrait of Herr Adolf Hitler. 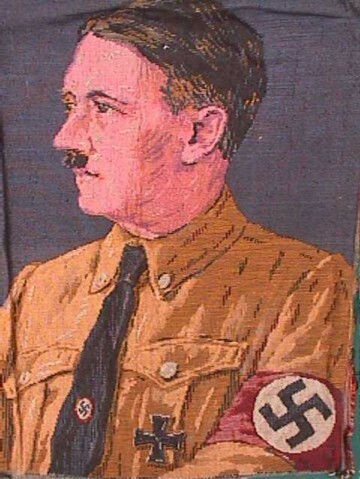 The project succeeded in depicting a remarkable lifelike image of the German leader as well as any painted portrait could do. The artist has even remarkably brought forward the special eyes of the subject so often visited in story and song. No politician before or since had this special magnetism reflected in the eyes. To be able to realistically capture this in marquetry is amazing and beyond! 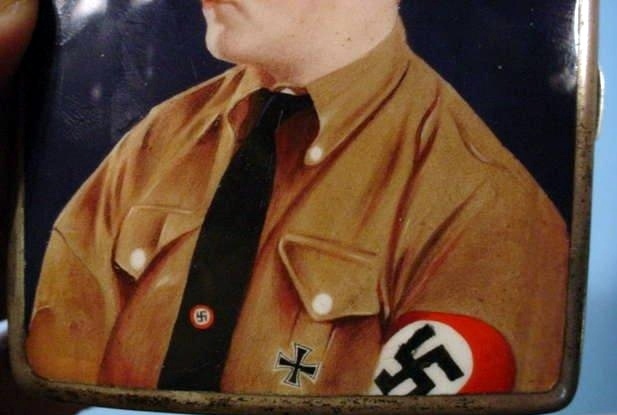 Even the rakish angle of his necktie is Hitler ‘all the way.’ Here is an ultra-important historical item, but also an item that is unique and an example of a long-lost art. 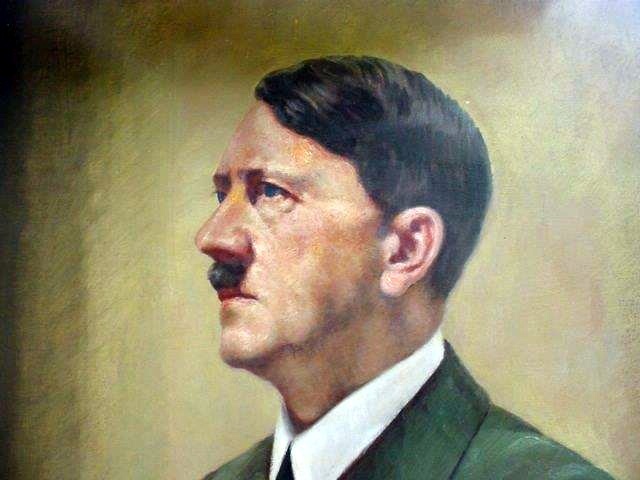 DESCRIPTION: Here is one of the very greatest paintings we have ever seen of Hitler in watercolor mode. First, please be given to understand that this is a 100-percent period painting done in 1941 (not a copy!). 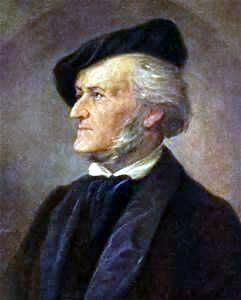 The artist is R. Winzen and we are still at the research stage regarding this name that is signed in the right-hand corner. 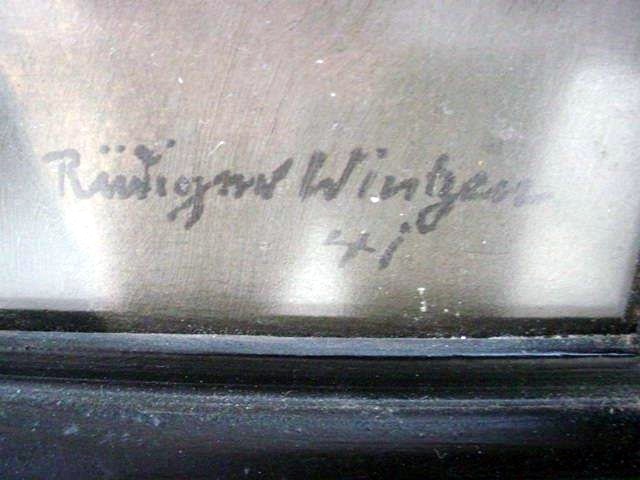 The last name is certainly Winzen; however, at this time we cannot make out the first name. 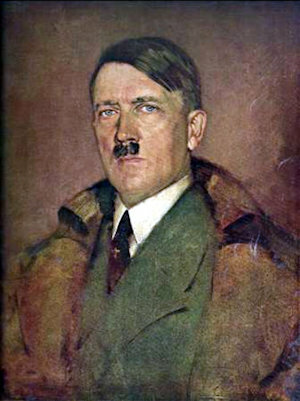 This painting would almost have to be considered a state portrait; it is just that fine, but Hitler did not pose for it. He never posed for any painting. He was just too busy every moment of his life to afford practically a moment’s pause. He did in the very early days pose momentarily to be photographed by Heinrich Hoffman, his personal photographer, but he never posed for the painters within the Reich. The only other moments when he actually was known to stand still was when he was attending one of Richard Wagner’s operas and then, of course, he was completely composed and at the same time overwhelmingly enthralled! An almost hypnotic spell overcame his body and soul and this is borne out by numerous witnesses to include his close boyhood friend, August Kubizek, in his book The Young Hitler I Knew. 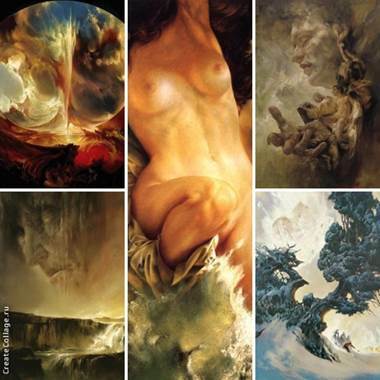 In 1933, when he ascended to power, thousands of paintings were accomplished of him. No world leader to date ever enjoyed such enormous popularity in the last numerous decades (at least since Napoleon). All the renderings were done from photos and listed artists did a few. By listed we mean artists that had reached some fame or at least had paintings accomplished that were noted in art gazettes and displayed in galleries. 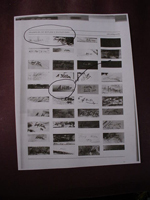 We are still researching the painter R. Winzen and we are sure he/she must be noted somewhere. If any art historian can assist us in this project, we would be very grateful if only because it is quite evident that the artist was rather a master in his own right. The Führer is seen in super-realistic form without a flaw. It is as though the painting could speak! Seldom does any painting pick up such realistic presentation and laudable verdict in human depiction. The face is perfectly lifelike! The clothing is also quite convincing with every flowing wrinkle, as it should be. 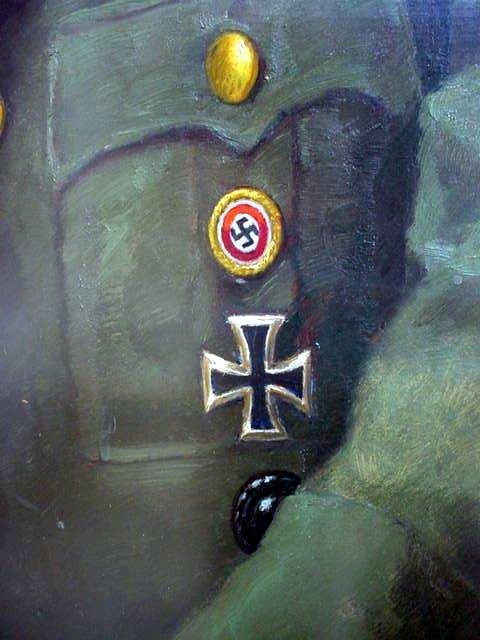 The color toning of the garment is done expertly and those medals and insignia seen upon it are depicted in realistic and historical accuracy. These medals were the only decorations Adolf Hitler ever wore. Although he had won the Iron Cross Second Class, he never wore it. He only wore the First Class award of this medal of bravery and above this he wore the Golden Party pin of the NSDAP, and below this badge of honor and loyalty he wore the German wound badge. There were all sorts of N.S.D.A.P badges that he qualified for, but he chose to wear none of them, and was always seen wearing these three decorations, two of which he won as a brave soldier in the First World War and he wore them on every occasion. 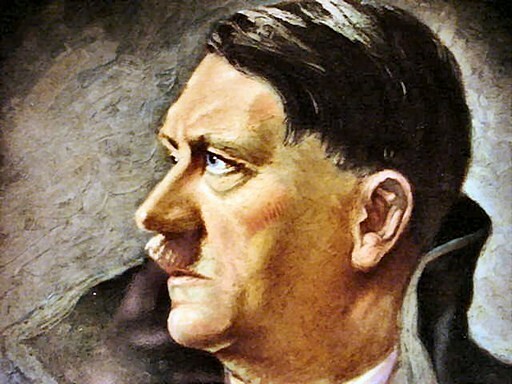 This painting in fact could have been meant to depict him as he made his famous speech before the Wehrmacht and Reichstag in his declaration of war on Poland in 1939. The painting was done in 1941, but the event was still in everyone’s mind because all patriotic Germans felt strongly that Poland should be severely punished for the horrible atrocities perpetrated against the German minority living there in 1939. The massacre at Bromberg stands out especially in the annals of heinous war crimes and now Hitler was having no more of it! On September 1, 1939, Germany launched its military forces against the Polish frontier. 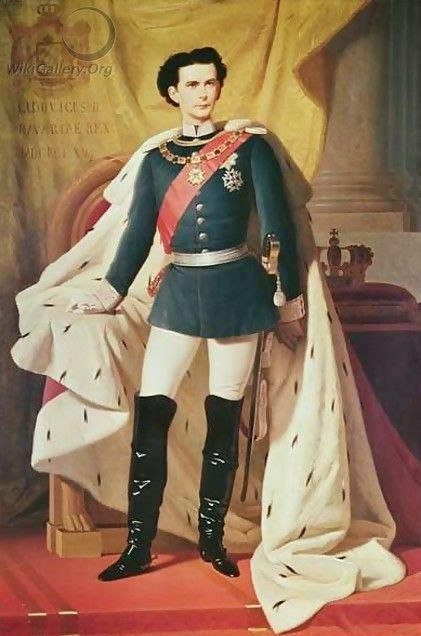 When the Führer declared war, he was seen in a pose much like this depiction in the Winzen painting and certainly, his outfit was exactly as depicted in the artwork. So, obviously the artist has pictured an earth-shattering event in his accurate portrayal. 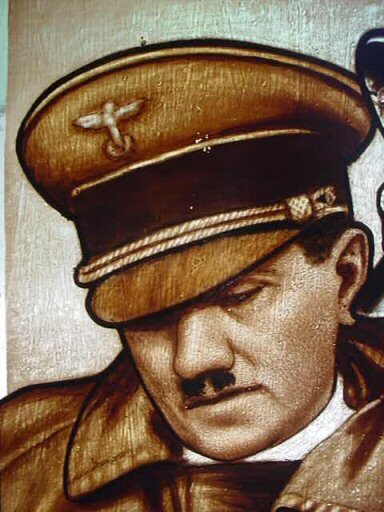 This sort of sets this depiction apart from 95 percent of paintings of Hitler that usually are bust portraits or full standing canvases that give at least the appearance of being posed. This depiction is of an actual historical event. We believe a watercolor was chosen because the crisp, neat lines bring out detail and feeling a bit more than oil paintings in at least some cases. 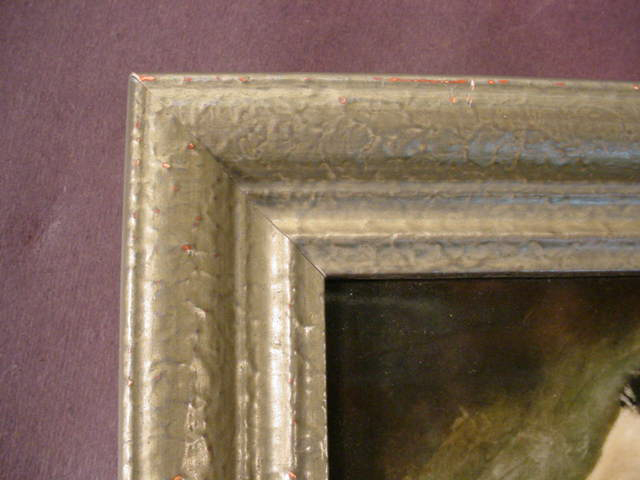 The paining, having been sealed in glass, has suffered some damage on the lowest portion near the edge of the frame, but this is not going anywhere. Watercolors were practically always sealed under glass especially if they were considered very important and were to be preserved for history, but unfortunately this made them quite vulnerable to aging distress and even the breaking of the glass. This wonderful artwork must be treated like the prodigiously valuable historic document that it surely is. We believe the frame to be original. The size measures at 32 x 11 inches and the frame is another three inches wide. 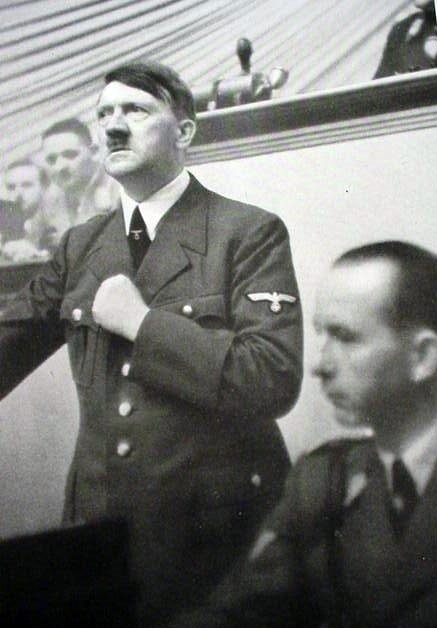 This is just about the most exciting and dramatic Hitler image we have ever seen and we have been looking at them as a compendium of over 100 years if all of our separate experience is recounted. We have visited some of the greatest collections and museum accumulations in at least four European nations and this painting would be voted the best for color, action, and detail hands down! 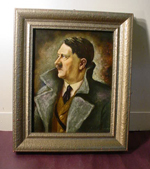 Elsewhere on our site you will occasion a half-bust portrait of Adolf Hitler in oil by the German master artist Otto Vittali that we also feature, but then that is another story; more on that later! So, collectors, here is a chance to own what would be considered a “National Treasure” if times were different. But now, in this Orwellian world, this work simply for now has to be considered a precious “diamond” yet undiscovered! with the hopes that the future might yet spring forth with some semblance of academic and artistic freedom and maybe even the possibility of truth and historical revision bursting to the surface, finally. This treasure of the turbulent past invites your stewardship meine Freund und Bewegungsglauber. 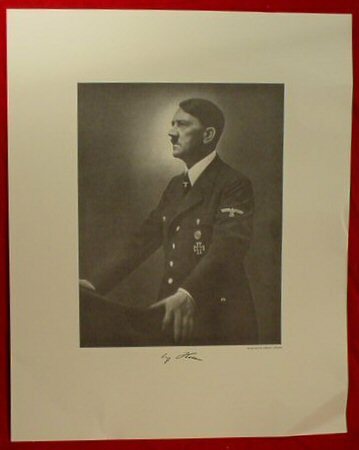 DESCRIPTION: This is a really great print depicting the German Fuhrer in the early days of the “Kampfzeit” (struggle for power) before the1933 victory of the NSDAP. 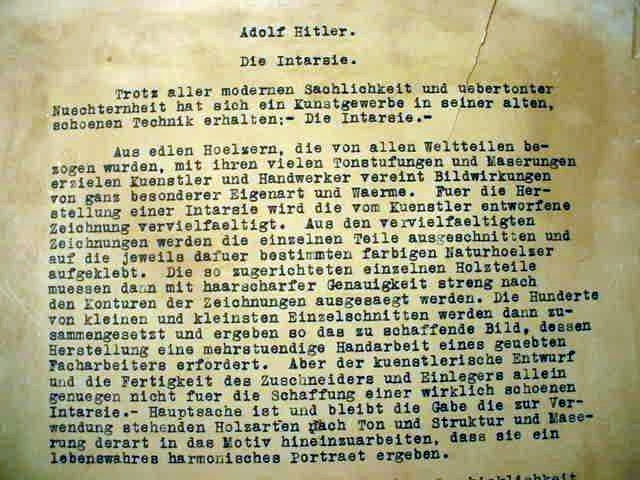 After Hitler became Reichs-Kanzler, he instituted the WHW or Winter Help Work -- a charity program with the slogan “None shall starve or freeze.” It was instituted in September 1933 and designed to provide food, fuel, clothing and various household items to indigent Germans at first and to war refugees and other civilian casualties in the later war years. In many ways it was similar to the U.S. Food Stamp program but much broader in its scope. Many little do-dads were issued to donors as a sign of their generosity made of plastic, wood, glass, etc. 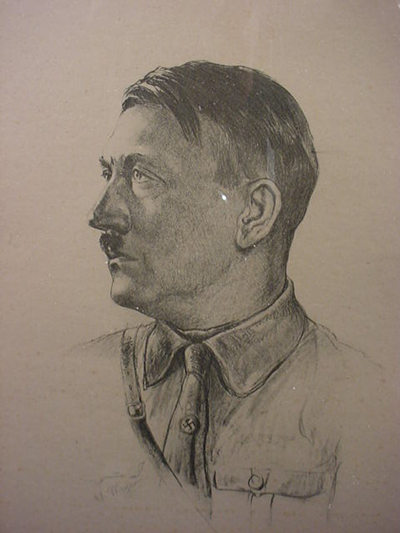 in myriad shapes and sizes, and to large donors the WHW officials would present this fine artistic rendition of Germany's Fuhrer. 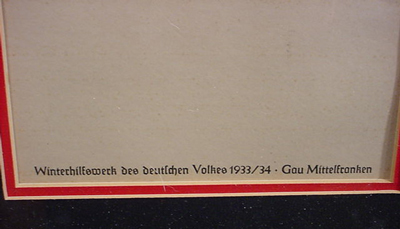 This one was presented to contributors in Gau (section) Mittlefranken in the years 1933 and 1934 as is printed at the bottom of the picture. In its frame, the drawing measures 19 x 15 inches and the actual print is 12 x 9 in size. Again this is a period print, not a page out of a magazine. It was made for special presentation and is historically important and an extremely fine WWII collectable. DESCRIPTION: Here is a very rare Fensterglas, or window hanging, in hand-painted glass. This is done with a process of painting on top of the glass and reverse, as well (a true German art form). 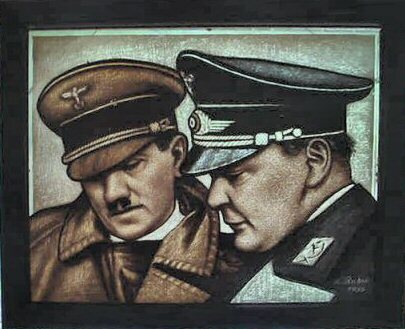 This depicts the Führer and the Reichsmarschal as they go over battle maps and plans together. It is beautifully done and measures 11 x 9 inches in its oak frame. The glass itself is 9 3/4 x 7 3/4 inches and is in wonderful condition and a real art rarity. 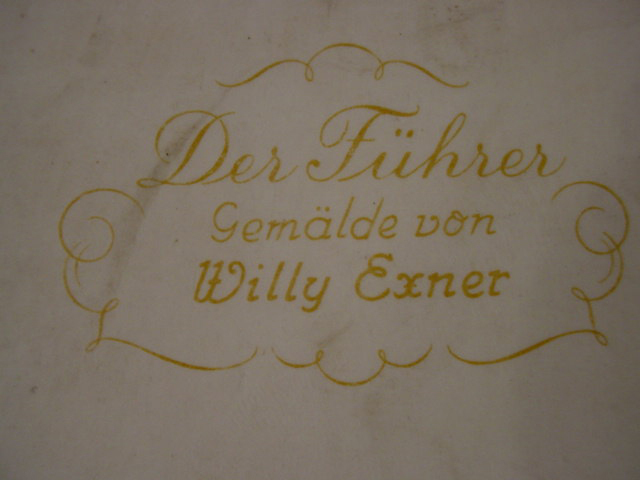 DESCRIPTION: Exner was a great artist working in the era of the Third Reich. 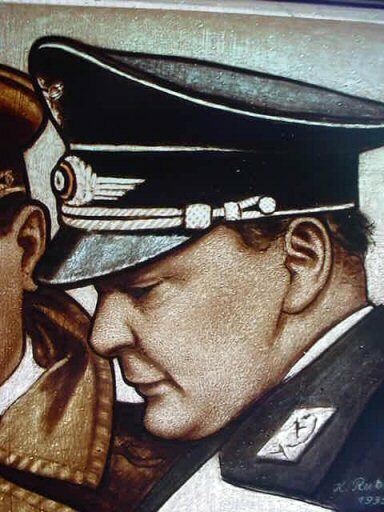 He painted several prominent Third Reich figures including Hermann Göring, Goebbels, etc. 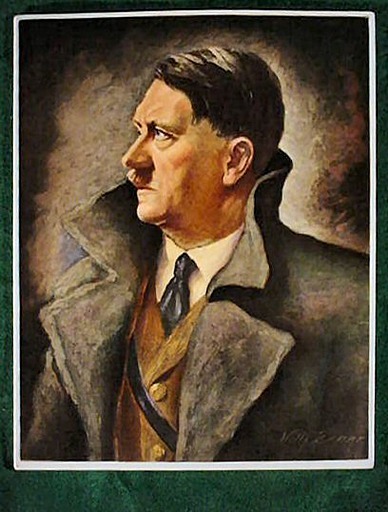 His portrait of the Führer was so popular that it was displayed in schools, offices, and public institutions throughout the Reich. You can see a print of Exner’s famous painting at Item AH 5-2. This one, however, is the Exner painting on porcelain and this brings out the color and detail to its zenith! 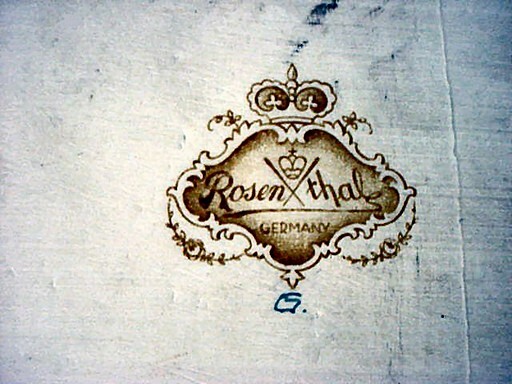 The porcelain was produced by the famed Rosenthal Company and is clearly marked on the back. 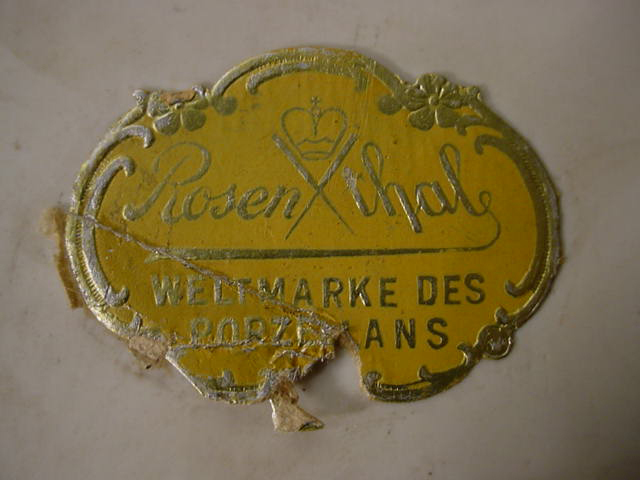 The condition is mint on its obverse, but one of the Rosenthal paper labels is missing on the back (no big thing!). The plaque is large—12 1/2 x 10 inches. They were sold by the Rosenthal Company unframed and it was left to the buyer to frame them. This is nothing short of a magnificent rendering. 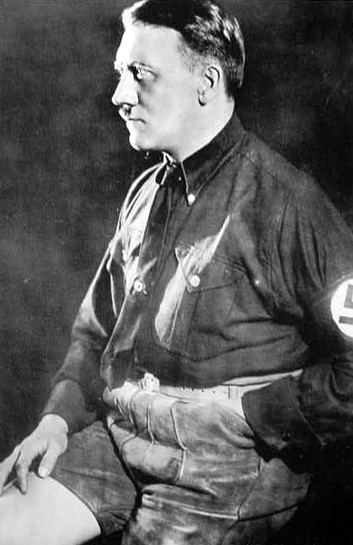 It depicts the Führer in his fifties shown here in his famous greatcoat. This is a historical treasure indeed, and at a very reasonable price. DESCRIPTION: Actually these are not posters in the actual sense. They are prints made for framing. They are from the Heinrich Hoffman studios in Munich. They were made for distribution to schools, public building, etc. They were also sold to patriotic people for display in their homes and businesses. These prints were found about 20 years ago in Germany in a warehouse auction lot the old wrapper that they were packaged in literally fell apart, but it was marked "Eigentum Heinrich Hoffmann verlag Munchen." 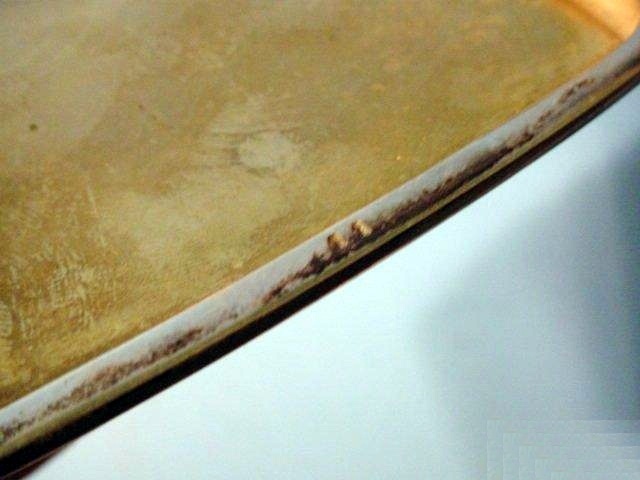 The condition is naturally excellent because of careful storage. There are two types. One is of the Führer in the official state portrait in the Feldgrau uniform (standing) as he made the famous Reichstag speech declaring war on Poland. 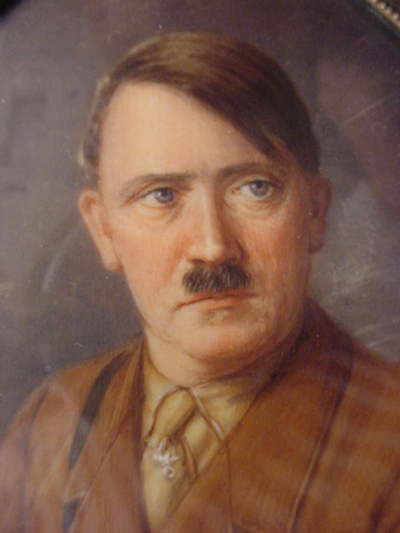 The other is the bust portrait of the Führer in the brown political tunic that he wore prior to 1939. 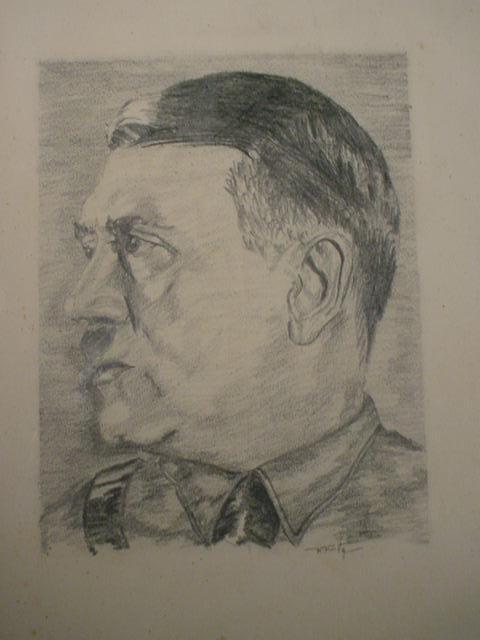 Both portraits have the facsimile signatures of Adolf Hitler under the picture. The entire print is 15 ¾ x 19 ¾ inches. The actual picture portion is 12 x 9 ¼. Very fine and of course historically important. PRICE: $125.00 each Please pick A or B; however if you want both make it $225.00 for the pair. These can be sent rolled and sent in a tube or if you prefer we can send them in a large cardboard box, but in this case we would have to take it to a professional shipper and this is much more expensive. We have had no problem thus far with sending in the tube. We now have only print (A); print (B) is sold out. after Hitler's coming to power in 1933 handled such prints. NO German nationalist’s home was without a picture of Deutschland's Führer. DESCRIPTION: This is the style of picture of the Reichkanzler that was put in government buildings and schools during the Third Reich era. 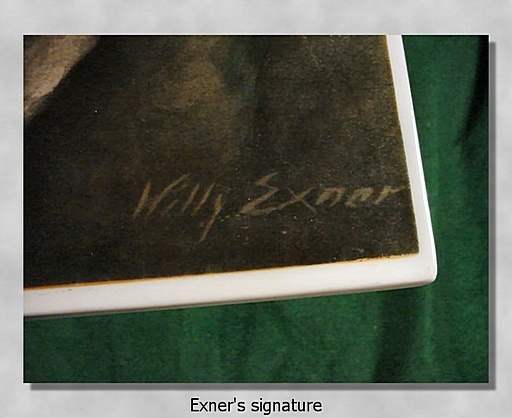 This is a completely original-period print taken from the famous portrait by Will Exner. The frame, while not being period, might as well be! It is with relief oak leaves so popular during the Rich and the symbol of German strength. 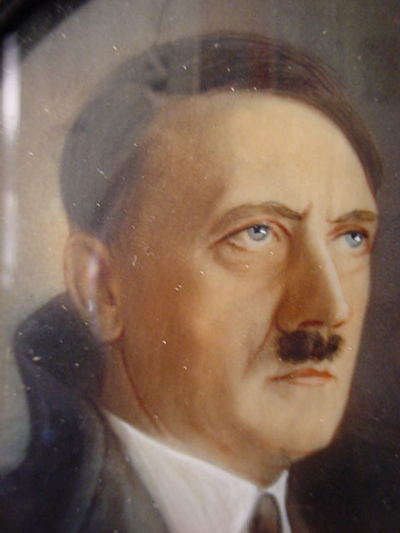 This is one of the best Führer portraits ever done. It measures 20 ½ x 24 inches with frame. Print itself measures 14 ¼ x 18. Here is the back of the frame. 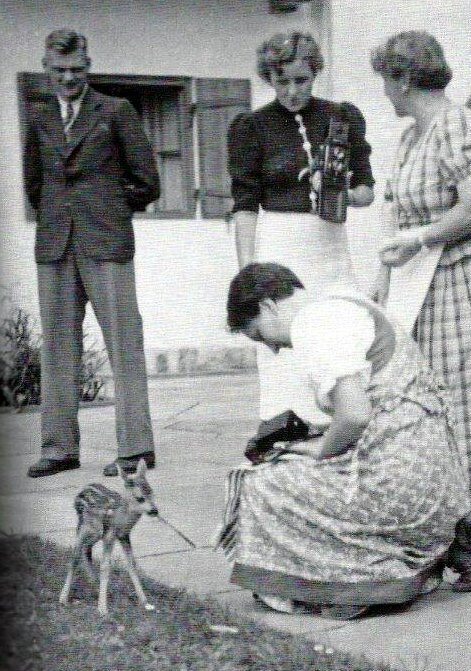 Döhring in 1937 at the Berghof with Eva Braun (with camera); his wife Anna is kneeling next to the fawn. 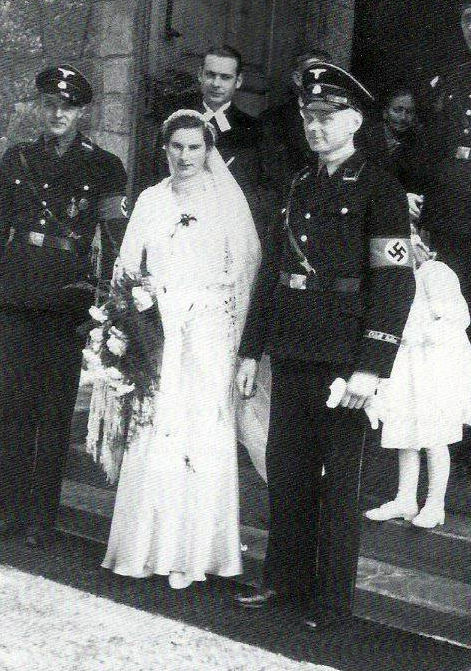 Herbert Döhring and Anna Krautenbacher were married on 10 December 1936, in Berchtesgaden. 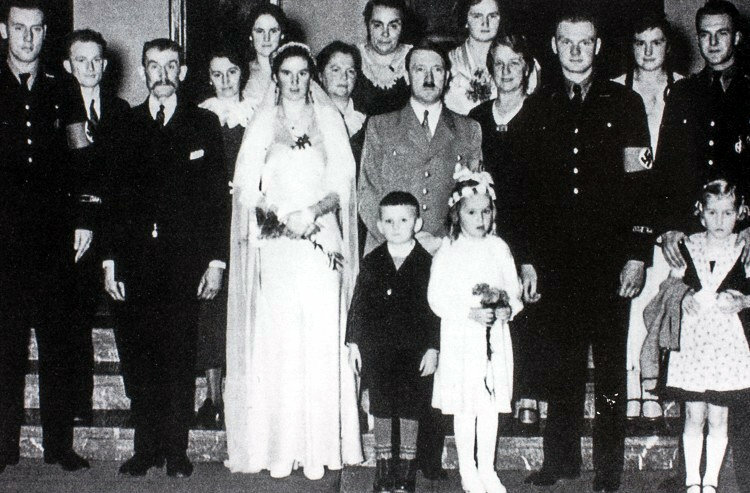 The wedding reception; Döhring is seen to the right of Hitler. 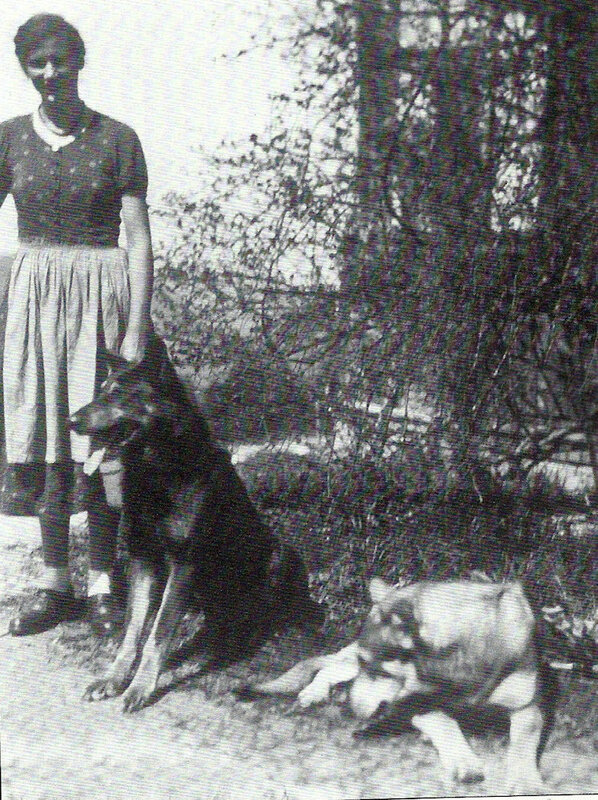 Frau Anna Döhring with Hitler’s dogs Muck and Blondi. 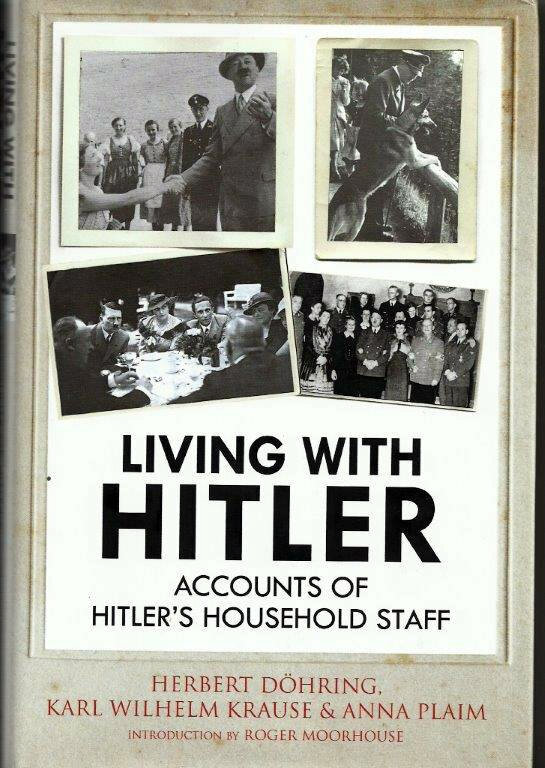 Book by Herbert Döhring and two others of Hitler's household staff. In this view of the Berghof,the two windows above the balcony belonged to the flat of the Döhring's. 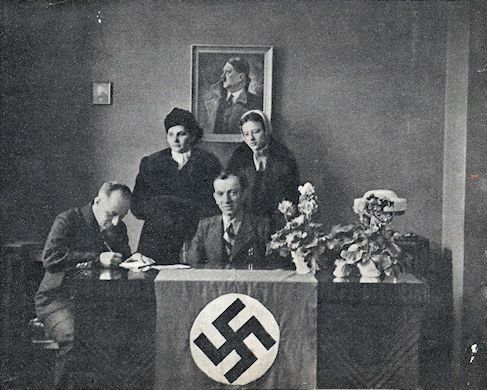 Photo was taken after the annexation of Austria in 1938. 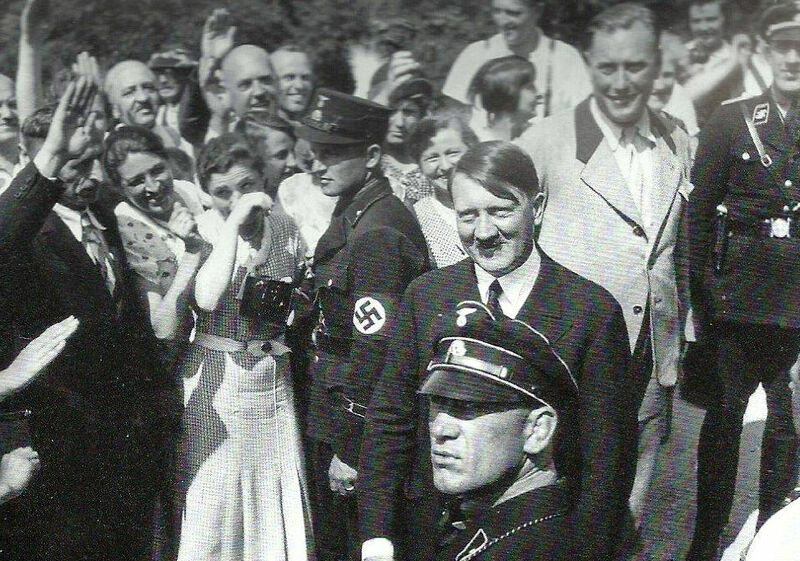 Here is Döhring standing behind Hitler watching him. 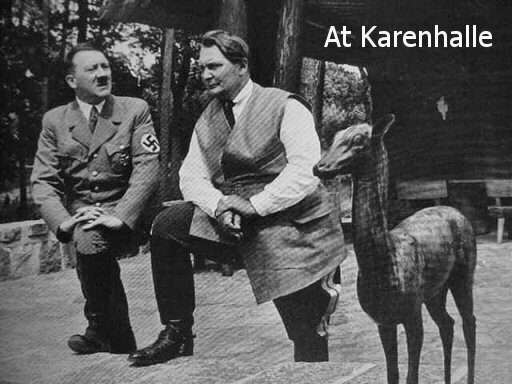 Hitler enjoyed walking along the Berghof trails with his compatriots. Here he is followed by his adjutant, Wilhelm Bruckner; an SS man with camera; and Herbert Döhring in uniform. DESCRIPTION: This is an extraordinary original watercolor by Adolf Hitler with absolutely unique provenance obtained from Herbert Döhring, who was a member of Hitler's SS personal bodyguard and later served as a supervisor of the construction of the Berghof and as caretaker of the complex. 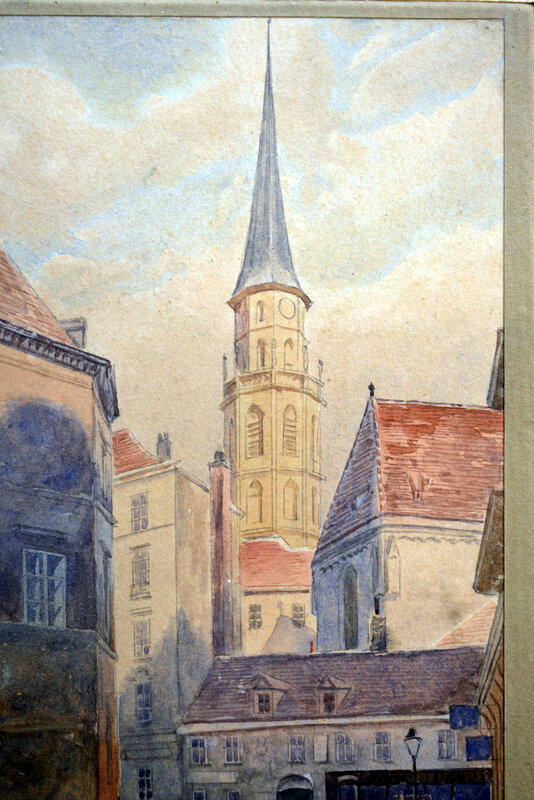 The 6- x 10 1/2-inch painting on paper is titled and signed in pencil at lower left: "A. Hitler '09 Wien I Stallburggasse.” St. Michael's Church is visible in the background in this Vienna neighborhood between the Stallburg and the Königinkloster. 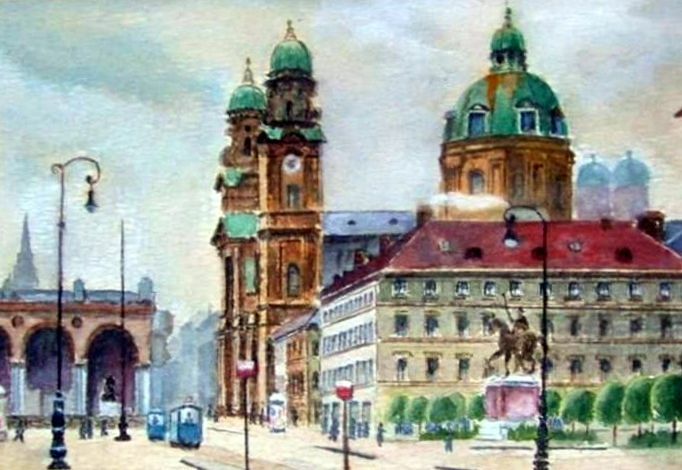 Hitler drew some of the elements—mainly architectural lines—in pencil, and used earth-tone washes for coloration with black lines to accentuate details. 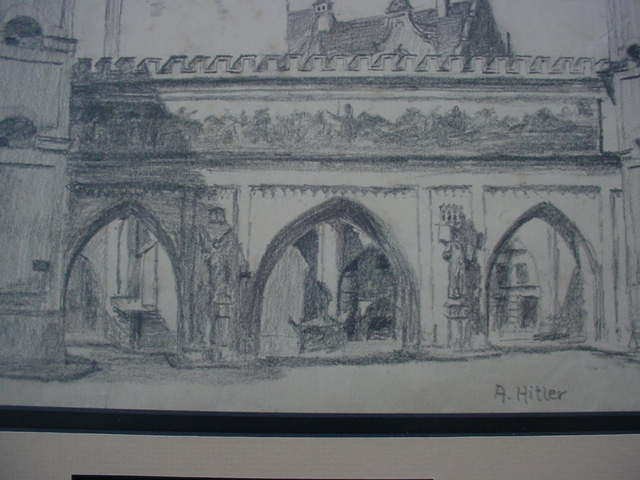 As is almost always the case with Hitler's works, his perspective is very accurate with buildings bearing the correct scale and angles for their location; however, rather telling are his renditions of the human form; faces are never shown, torso and limb lengths are incorrect, and the perspective employed in the placement of the figures are often incorrect. These deficiencies were said to be what caused Adolf Hitler to be rejected from the Vienna Academy of Fine Arts. The painting is double-matted in gray and white, all set into a ca. 1940s or 1950s mat. 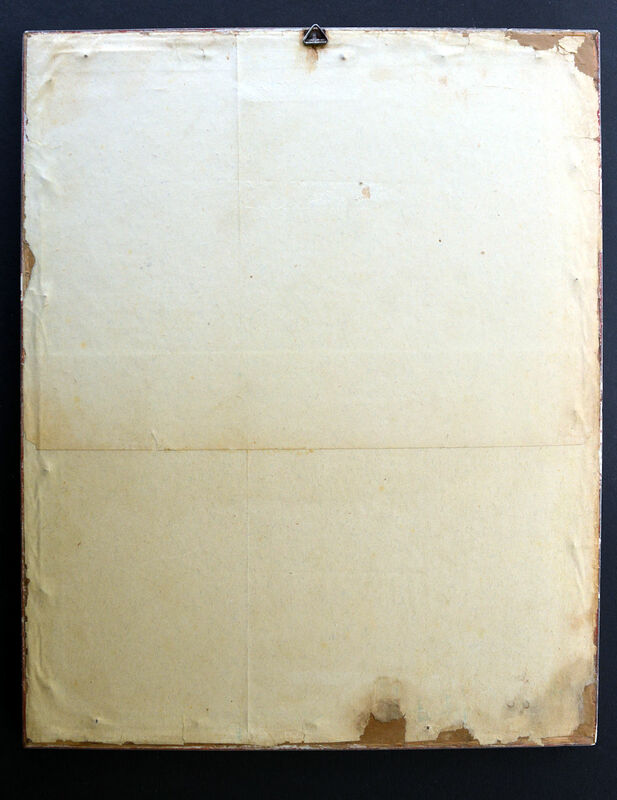 The back of the frame has never been opened. Very fine! 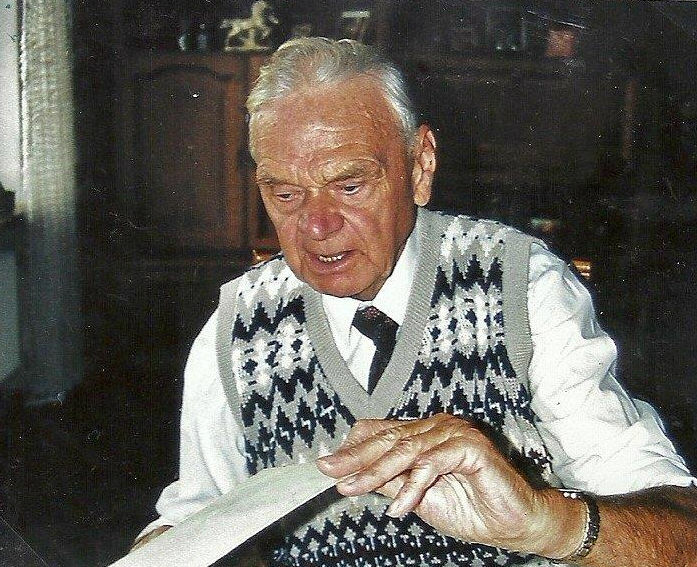 Herbert Döhring (1913-2001) served with the Leibstandarte-SS Adolf Hitler as part of its 30-man personal protection command tasked with up-close protection of Hitler. 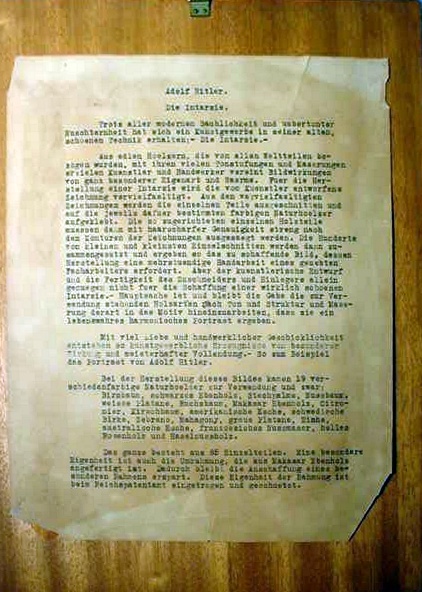 Döhring then took over supervision of the Berghof, working first in the original Wachenfeld structure before assuming full caretaking responsibility. 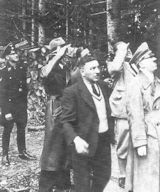 While there, Döhring met his future wife Anna Krautenbacher, a staff member, and he married her with a reception at the Berghof with Adolf Hitler in attendance. 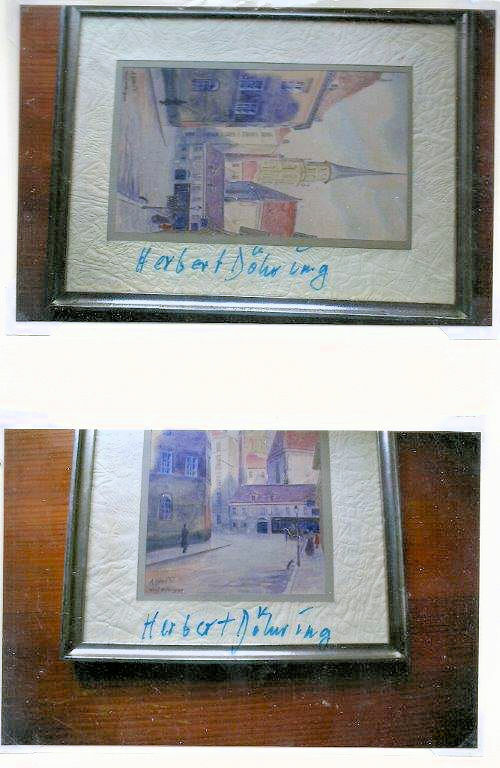 Provenance that is present with the painting includes: a signed typed statement by Herbert Döhring, at Hersbruck, Aug. 12, 1999, in which he states (in German): "I attest to the authenticity of the watercolor 'Stallburggasse' by Adolf Hitler, signed and dated '09. The painting was a present from chambermaid Lina Dannat to my wife . 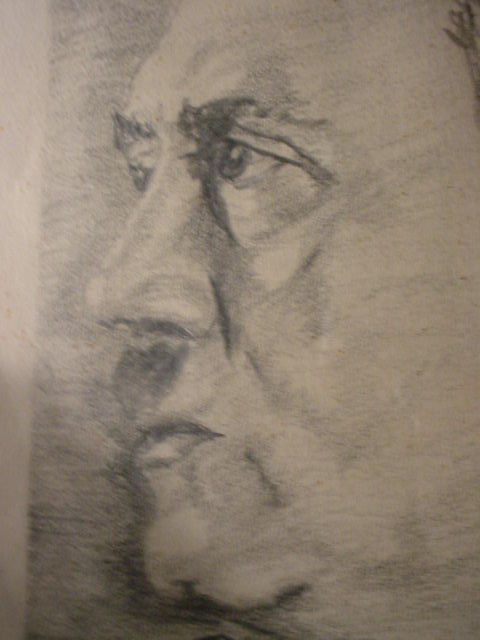 . . She presented this picture to my wife in 1942 at the time of our departure from the Berghof. I don’t know under which circumstances Ms. Dannat received possession. It is well known that many of these watercolors were stored in the gifts room on the second floor as well as in the large closet in the Great Hall . . . We hid the picture during the war years and had it framed in the years after the war. It was until today in my personal possession." Also included is an A.N.S. by Döhring, Hersbruck, Aug. 14, 1999, sending two detailed photos of the painting which he has signed (photos also present) and a note to a friend mentioning that the aforementioned Ms. Dannat had died the previous January. 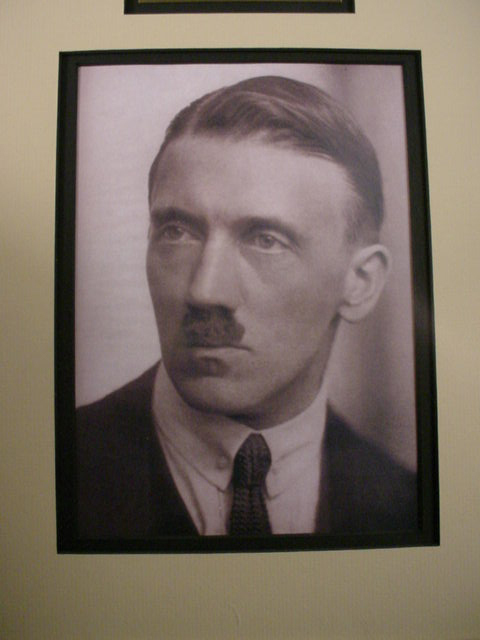 There are also copies of original photos of Döhring, his wife, and the Führer at their wedding, Döhring at the Berghof in 1941, and this man in 1999. 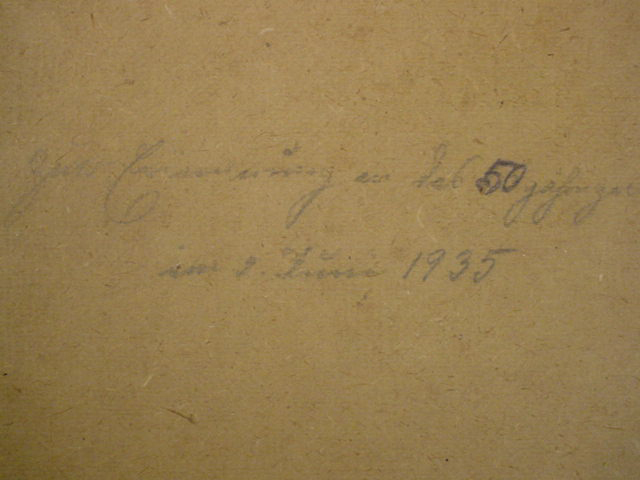 Finally, there is a copy of Döhring's modern signed identity card and a notary's attestation of his signature. Our consignor has added a copy of Döhring's memoirs (in German): "Hitler's Hausverwalter" (Bochum: Zeit Reisen Verlag), 2013. 94pp. 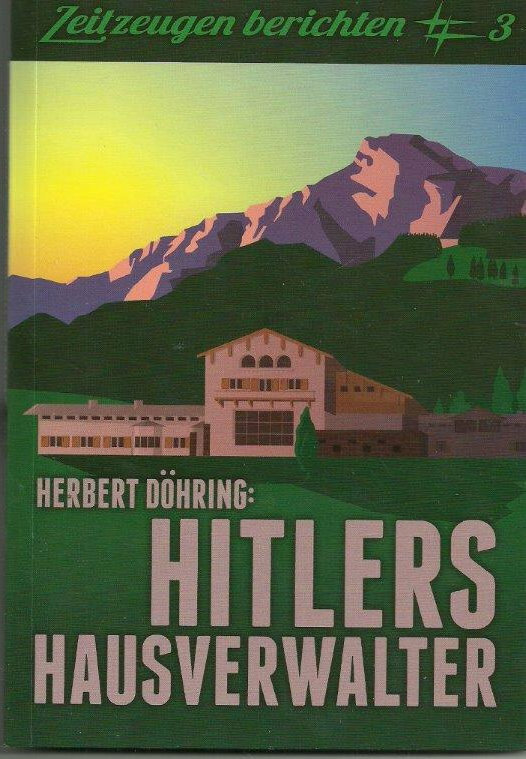 8vo.” We will include a copy of Herbert Döhring’s book in English titled Living with Hitler, which is an account of his service as caretaker of the Berghof, with photographs of the author, Hitler, guests, etc. 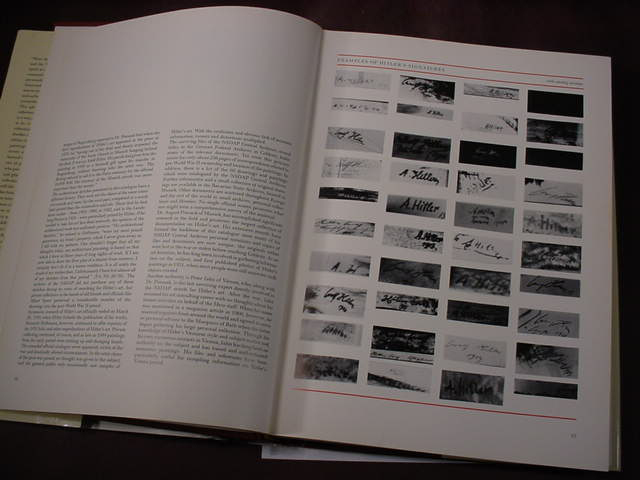 Also included are two photographs of the details of the painting that he took during the later years while it was still in his possesion and he signed them in blue ink. 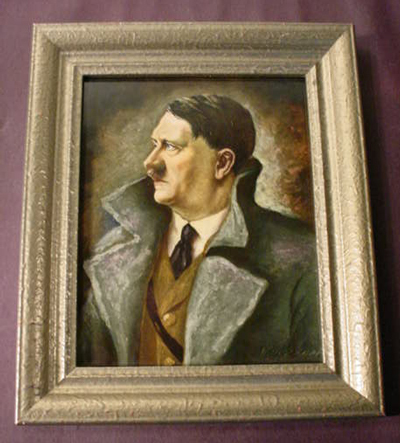 Döhring's friend Ms. Dannat may have been gifted the painting by Hitler, or she may have pilfered it. This may explain why Döhring chose to hide the painting until after the war ended! 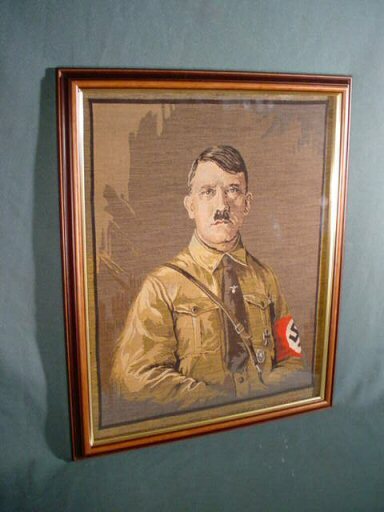 In any event, this painting is, in our experience, nearly identical in regards to subject, size, composition, technique, and perspective as almost every other authentic Hitler painting offered by us and other experienced dealers of Hitler's works. 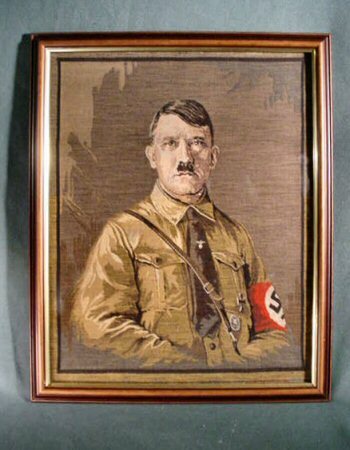 It’s the very best provenance we have ever encountered; having sold other Hitler watercolors over the past thirty years, we are 100-percent confident in the authenticity of this wonderful example of original artwork by Adolf Hitler.